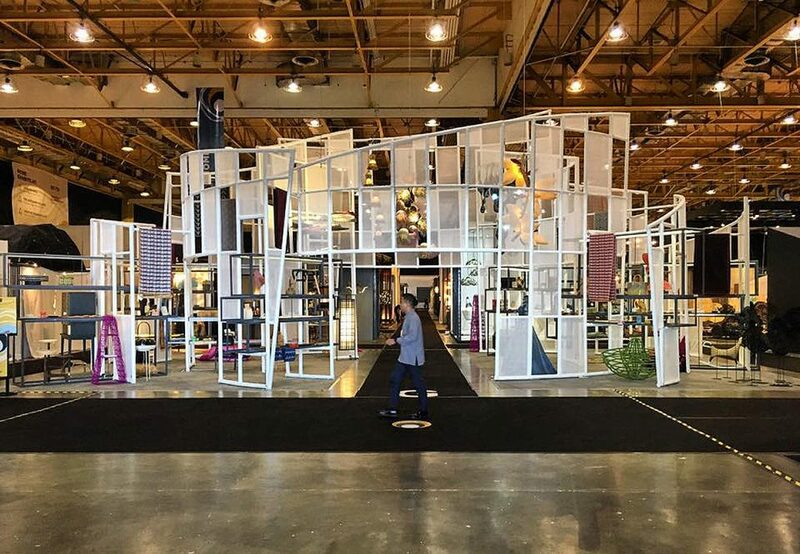 When people hear the recommendations of design analysts at a world-class fair such as Maison&Objet each year they sit up and take notice. 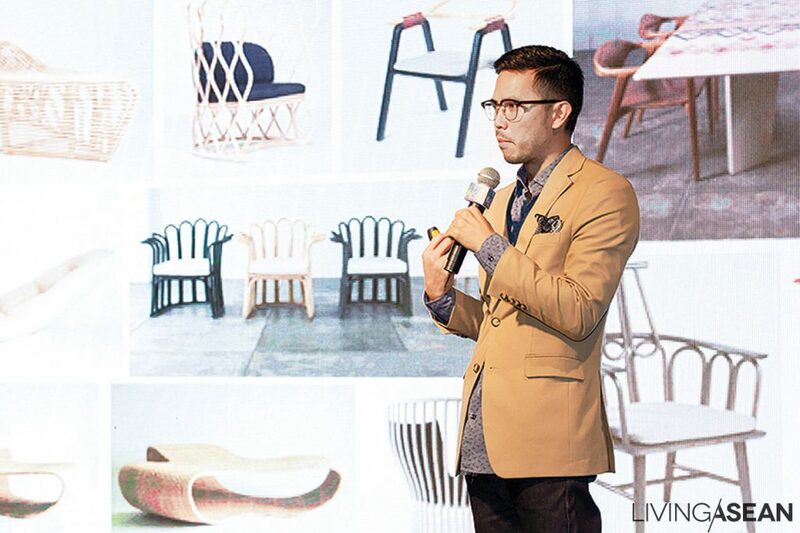 In 2018 all these analysts are in agreement that the power of digital technology is dominating lifestyle trends, turning living spaces into showrooms. Special 1 “I’m slowlife?” Morakot Siriphala is a student at King Mongkut’s Institute of Technology Ladkrabang’s Department of Communication Arts and Design’s, Photography Division This socially satirical photo of hers illustrates the modern role of social media in people’s lifestyles. A team of design trend analysts led by Vincent Grégoire, of the world-famous agency NellyRodi, finds that financial crises and the digital revolution have had an enormous effect on consumer behavior. Where brand loyalty was once given without question, now consumers themselves control the discussion and influence sales through the internet. They can get product data, compare prices, make comments, rate with stars, and become marketing partners the brands are unable to ignore. 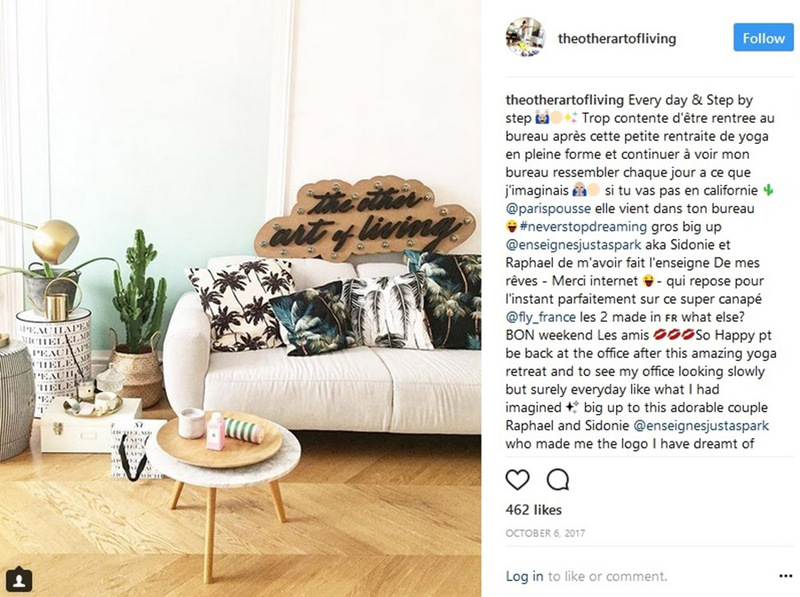 When one such consumer wants to share data or pictures of products, they do their posting from their own home, making it the place where inspiration is born. 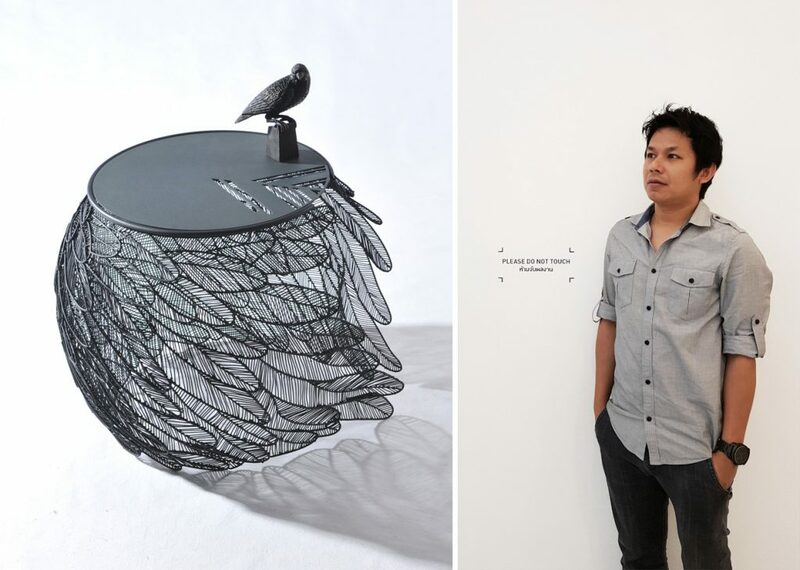 The consumer becomes art director, designer, architect, merchandise display department, marketing department, and possibly an ambassador for the brand. Music is added, spots within the home are on display as the home becomes a social media showroom for launching product reviews. 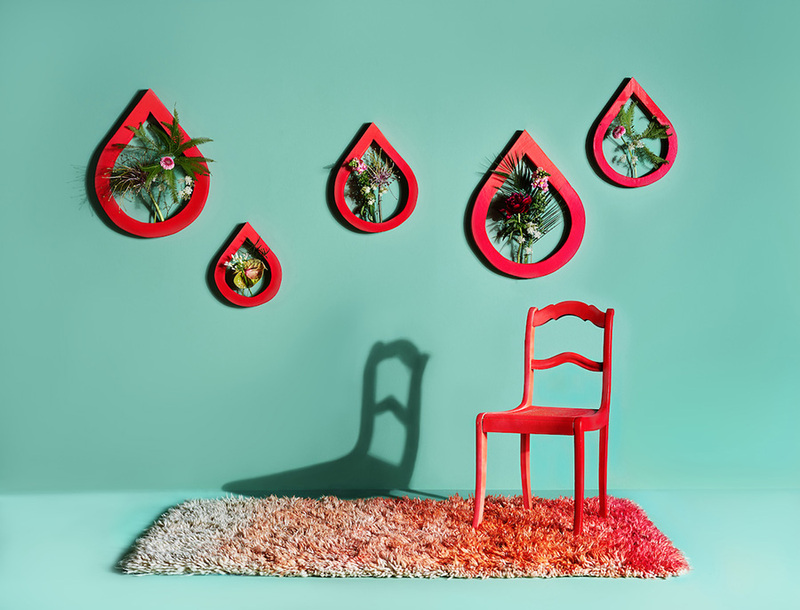 This showroom trend is a sign of our growing willingness to open up our private lives to the public. Maybe we want to create a beautiful picture, and after the creation it’s already obsolete when you’ve told it. People would rather touch it, experience it, actually living the story as it’s happening: “story-living” instead of storytelling. 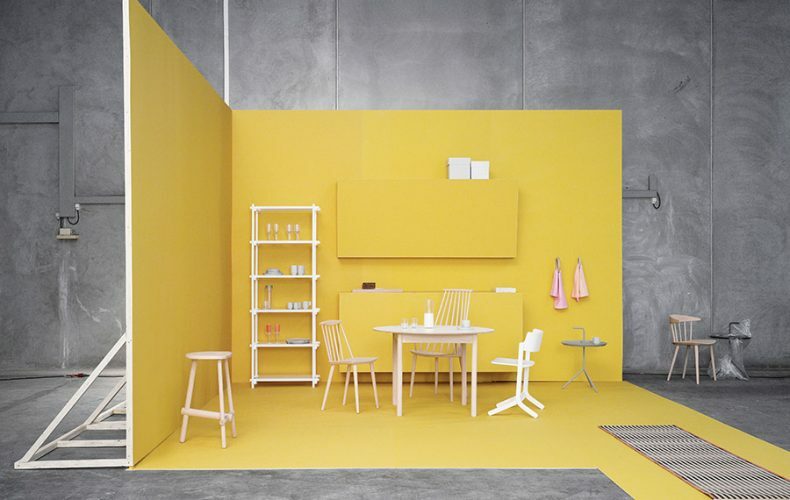 This is what we call “showroomisation”: every space becomes a showroom. What moves the consumer nowadays is not a brand or product, but those consumers themselves, from their participation in product and brand creation. 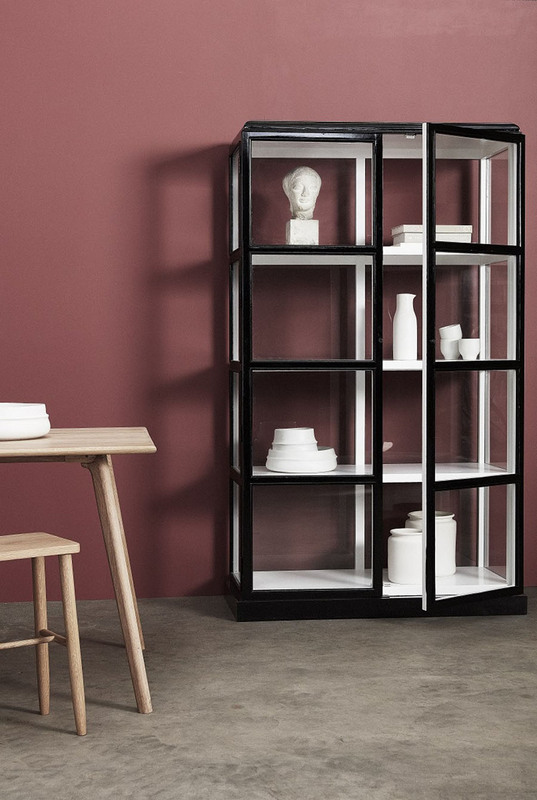 This showroom trend directly affects modern life. 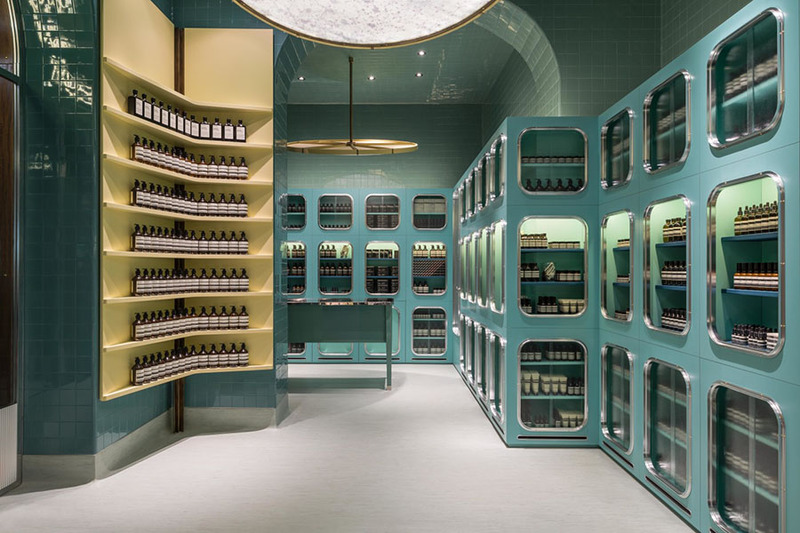 Since it involves internal design, it’s often made up of showcase-like items: hanger bars, glass backdrops, shelves, mirrors, maybe a walk-in wardrobe, clothes, etc., all artistically arranged. 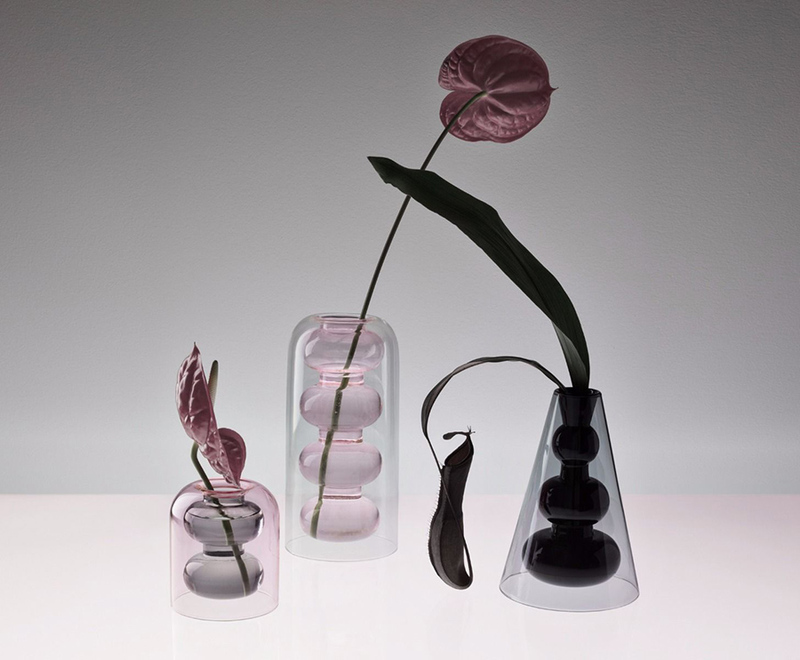 Very often transparent materials are used to highlight the work. 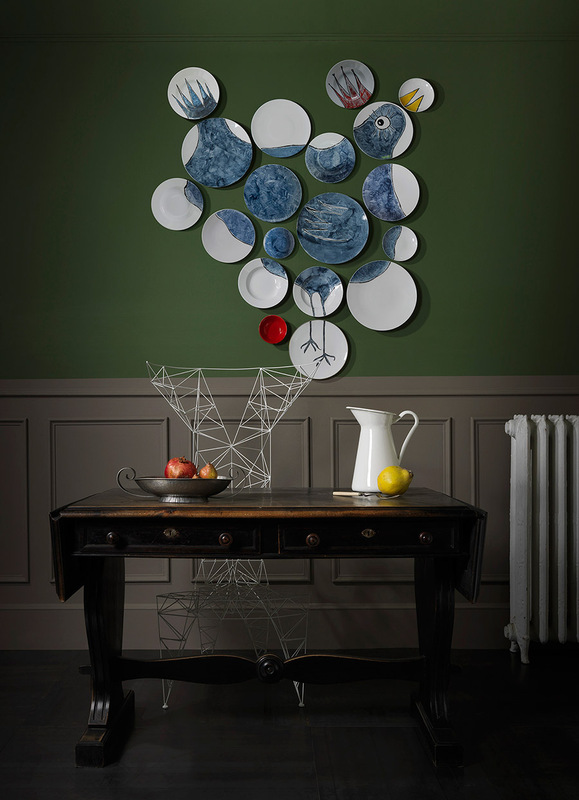 Walls are used to hang pictures, dishes, or other ornaments. Humanity becomes the subject, with portraits, puppets, and masks. 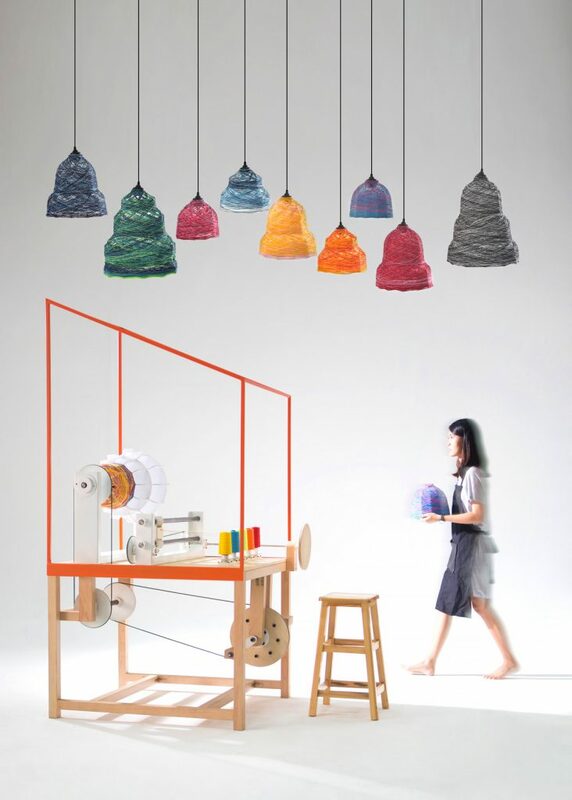 Even carpets and lamps have personality, as the Facebook experience draws them in to become part of our the home. 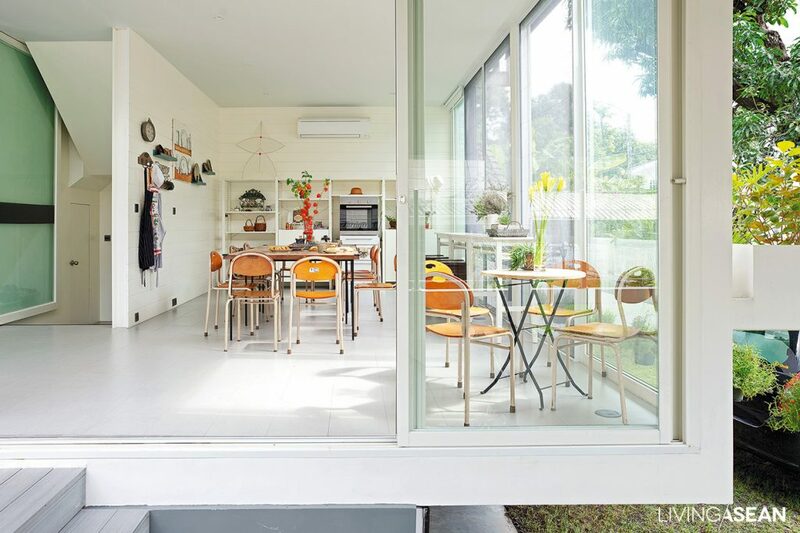 Home owners are collectors and curators at the same time, as they mix and match products of various brands in personal forms and styles and arrange them around the home as if they’re just waiting to be an Instagram picture. This is part of how identity is created in the online world. Products and brands are presented in a way that’s easy to understand. The brand is right there, speaking for itself, and that gives it more influence. 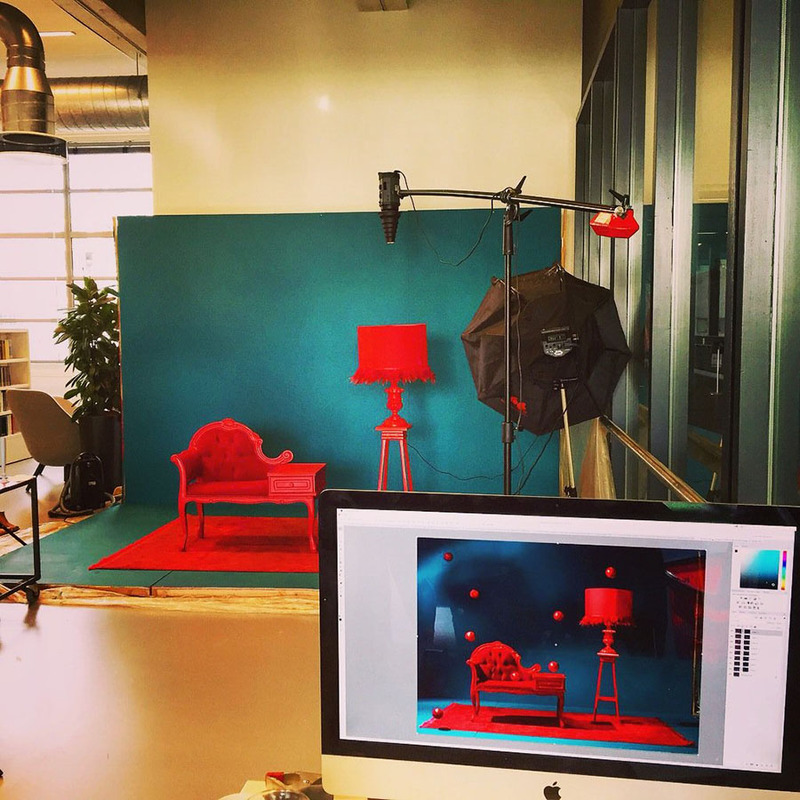 Design trends that pump life into businesses are making shops more homelike. because customers want spaces where they can relax, experience products, and talk about them with friends right away. The fashion currents of the world have already changed direction: no more are there such things as good or bad taste. 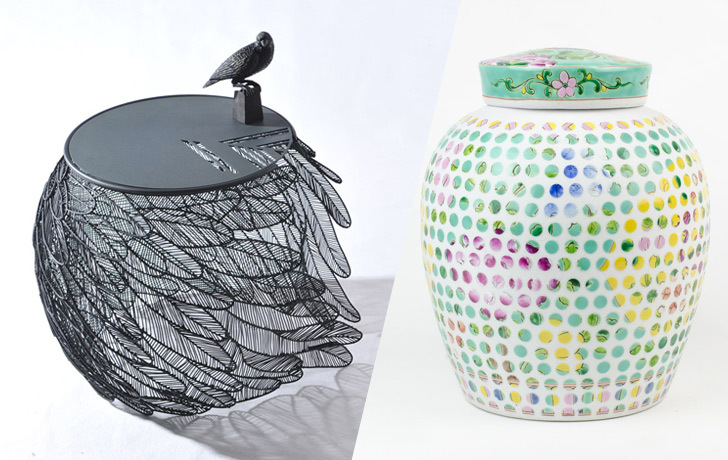 High-priced design work often intentionally has the look of cheap bric-a-brac. Business should connect with the spirit and feeling of these fashion trends, for a sensation of surprise and the new directions that are here. 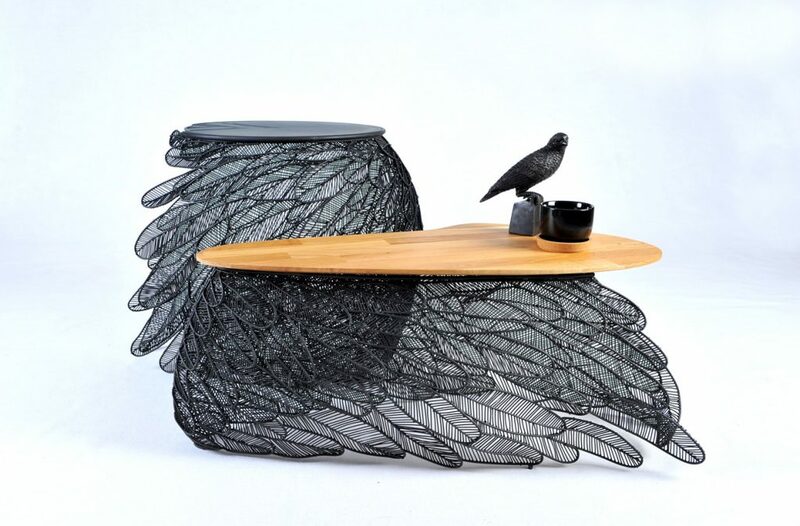 And this will be made tangible in Inspirations Space at the Maison et Objet Fair from 19 to 23 January in Paris, France. Inspirations Space will present these trends in a place that encourages relationships among visitors through fresh experiences. The exhibition area is packed with tables filled with examples illustrating these currents of change, trends that are coming on strong. This won’t have much in common with the peace and quiet of traditional exhibitions. Here’s your chance to step back and get an overview of what it’s like and give your own opinions. Why do you love or hate this trend or that? Hey, it’s what all the cool social network kids are doing! 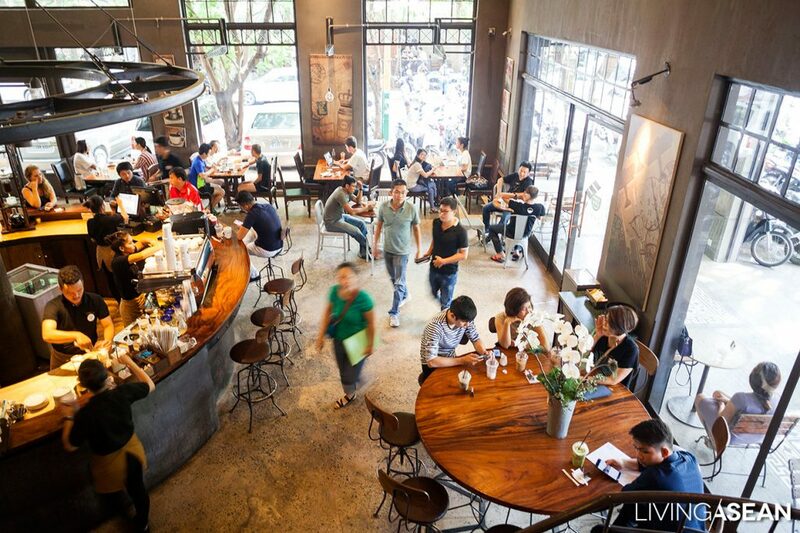 Café culture is blooming in Phnom Penh. 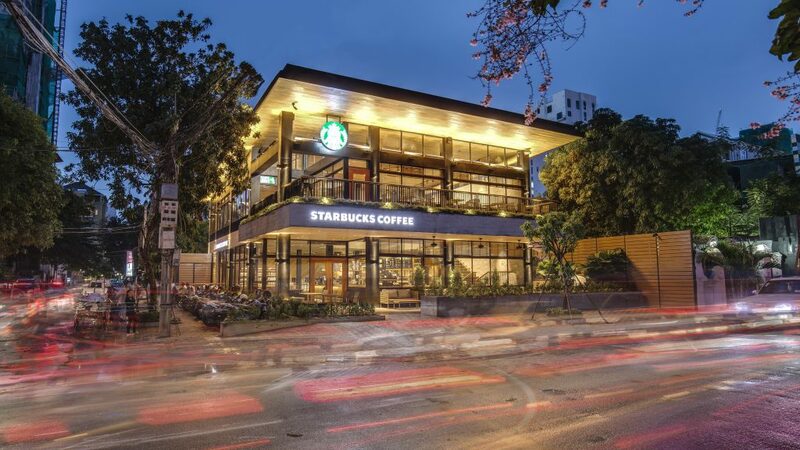 But here, unlike other cities in the world, Starbucks is not the leader in the business. Let’s find out who really is the coffee king in Cambodia? 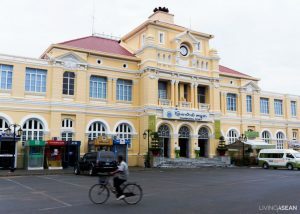 Brown was founded by four Cambodian cousins. Chang Bunleang is responsible for running the business. 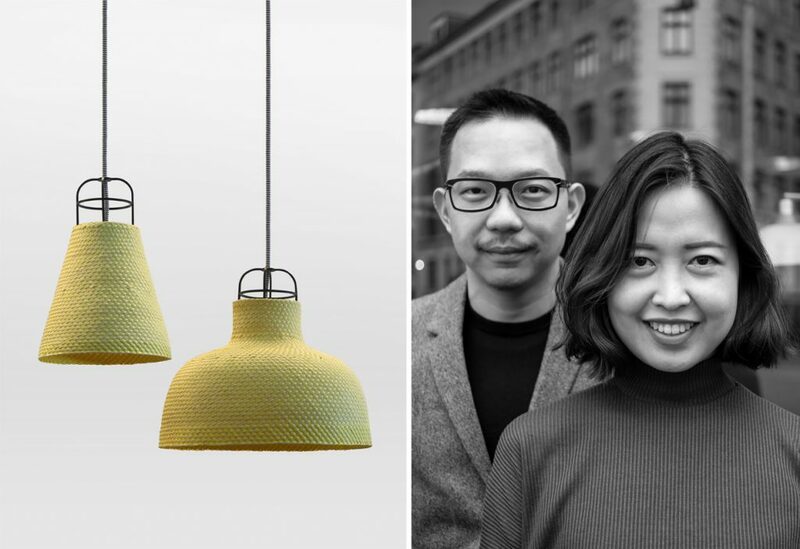 Kang Hok is the architect, while Chhong comes in as pastry chef and interior designer, and Kang Sen as structural engineer. 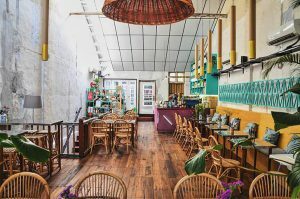 They opened the first café on Street 214 in Phnom Penh in 2009. It is locally known as Brown Samdech Pan. 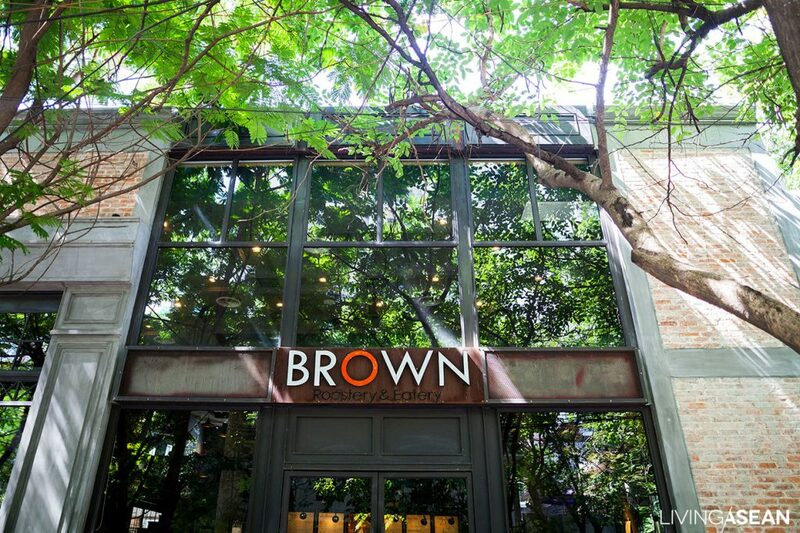 The brand “Brown” is synonymous with “t’nort”, which is Khmer for the color brown and the national tree of Cambodia. 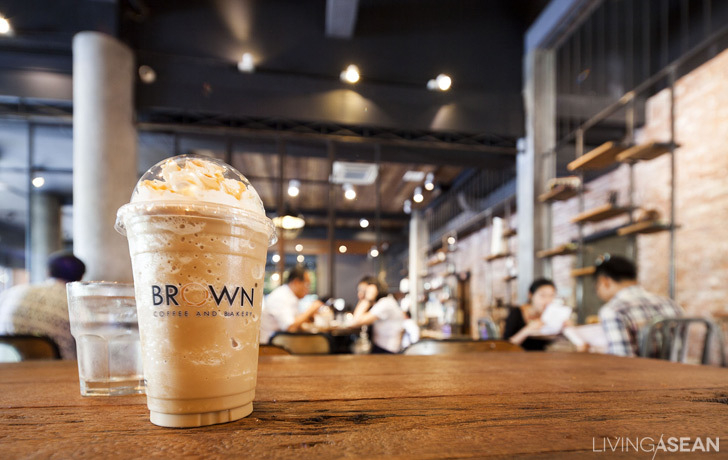 Nowadays Brown has 14 shops on prime locations, which have become popular hang-outs among students, young professionals, middle aged people, and expats. 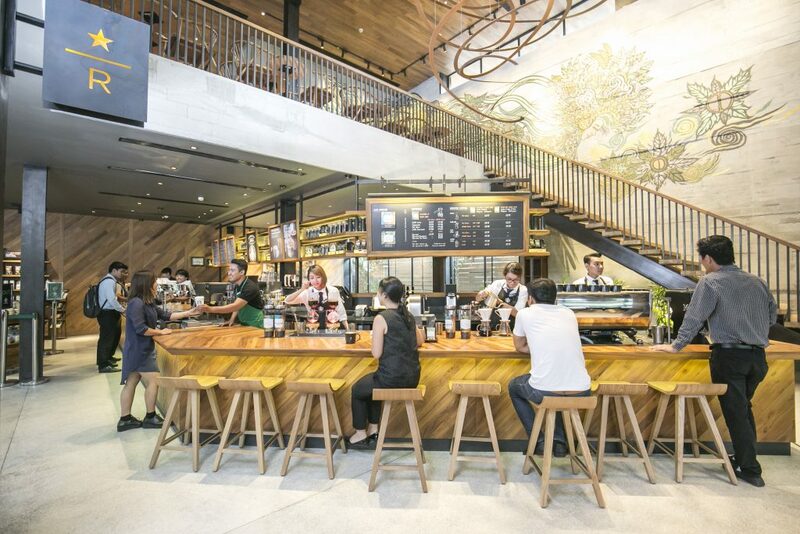 Starbucks made its debut here in 2015 and has since had 5 outlets at tourist spots, like BKK1 and AEON Mall. Actually, there are other players in the business besides Brown, and Starbucks. They can be found at practically every corner in the city center, among them Gloria Jean’s, Café Amazon, and local cafes. 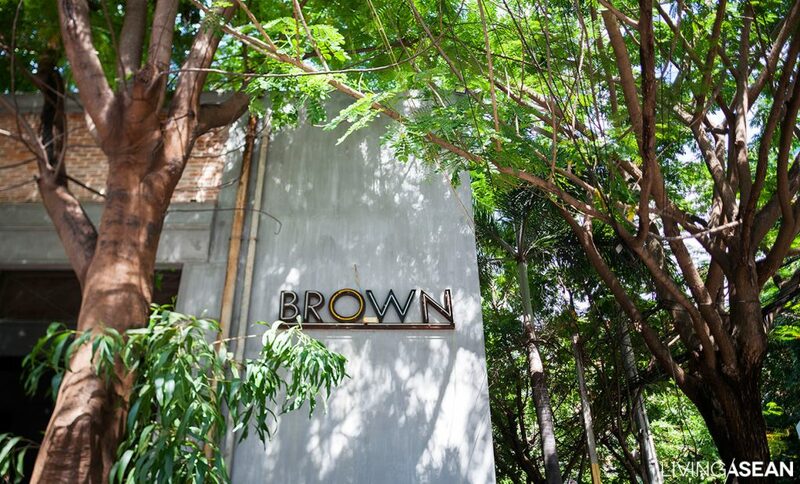 But Brown is clearly outstanding in terms of architecture, interior design, food on the menu, and especially the staff, who take orders from the table. 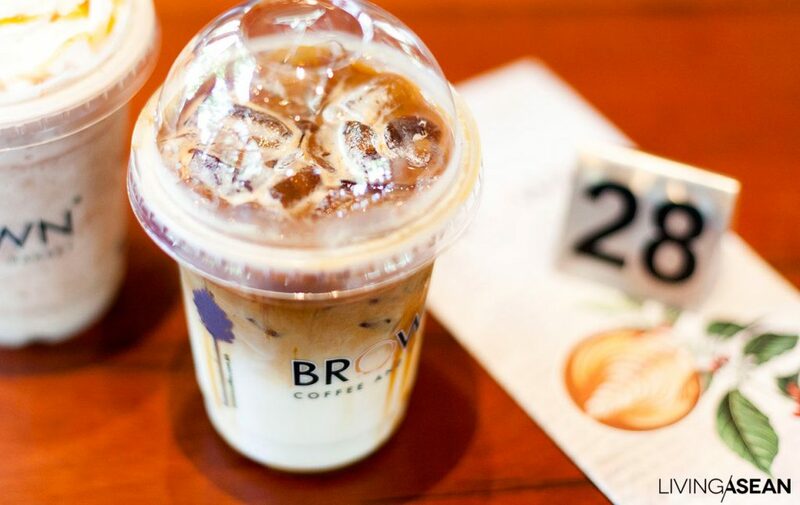 Coffee quality is the thing that no one can take away from Brown. It’s the local hero, like “Jack the Giant Slayer” in Cambodia’s coffee business. This place is really cool. From the outside, it looks like 3 boxes, one atop the other. Inside it has everything this lovebird pair of chefs could want. 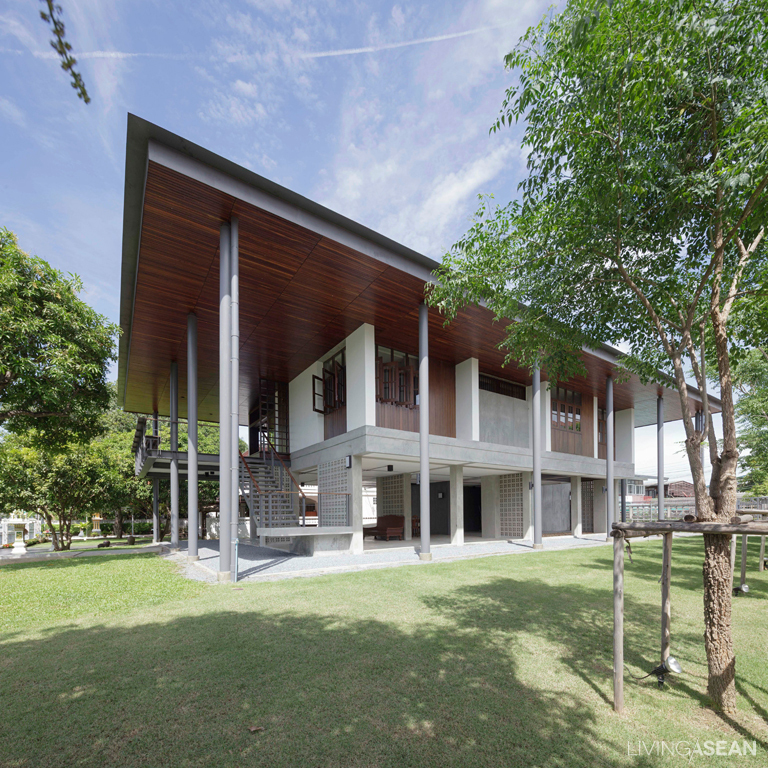 Story: Wuthikorn Suthiapa /// Photography: Soopakorn Srisakul, Nantiya Bussabong and Spaceshift Studio /// Design: Sook Architects Co.,Ltd. On first stepping into the house you don’t see the expected living room, complete with sofa and TV console, but rather a dining table long enough to sit 8-10 people. Owners Oh (Nanthaphon Lilainukul) and Art (Thirayuth Khongdee) have a Facebook page called “The Dish Whisperer” for cooking aficionados. They told us that when their daughter was born continued life in their condo didn’t lend itself to cooking, so they looked around for a new residence. 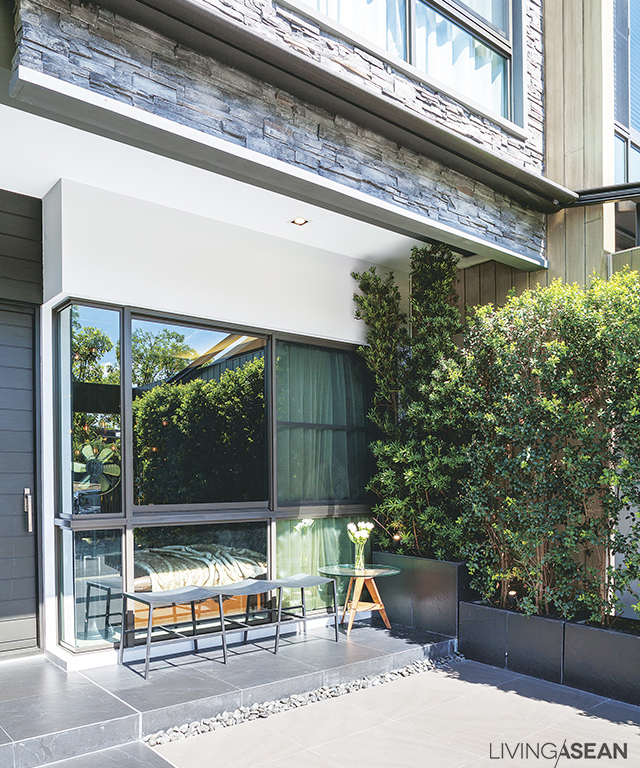 Art notes that the 3-storey design uses vertical space to advantage on this compact lot. 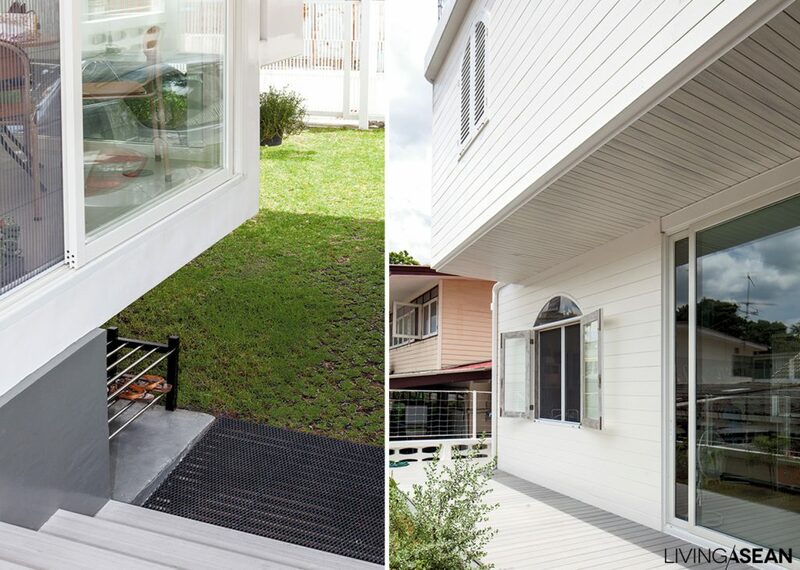 To guard against flooding, the house is one meter higher than the foundation. In the cellar such things are stored as jars of organic vegetables preserved by Oh herself. 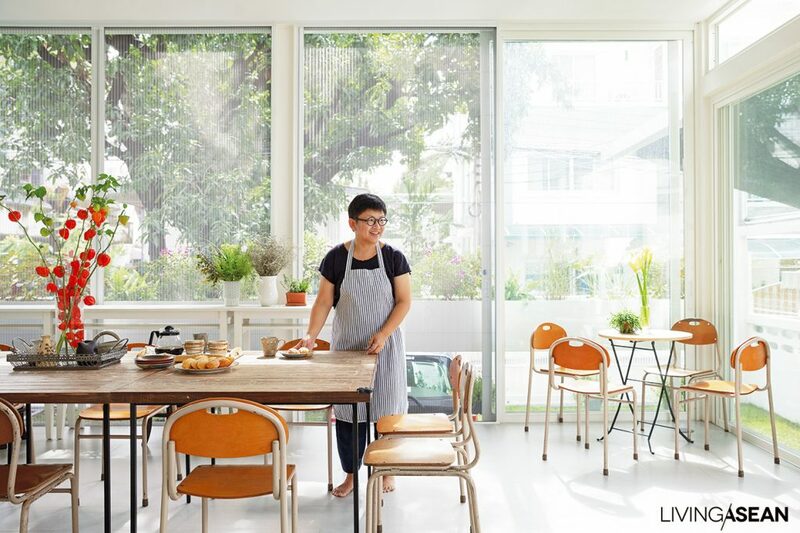 The first floor is made up of a studio featuring that long table which – besides dining – is used for receiving guests and holding cooking workshops: Oh is a certified chef with a specialty in French pastries, while Art is a master of Thai food. 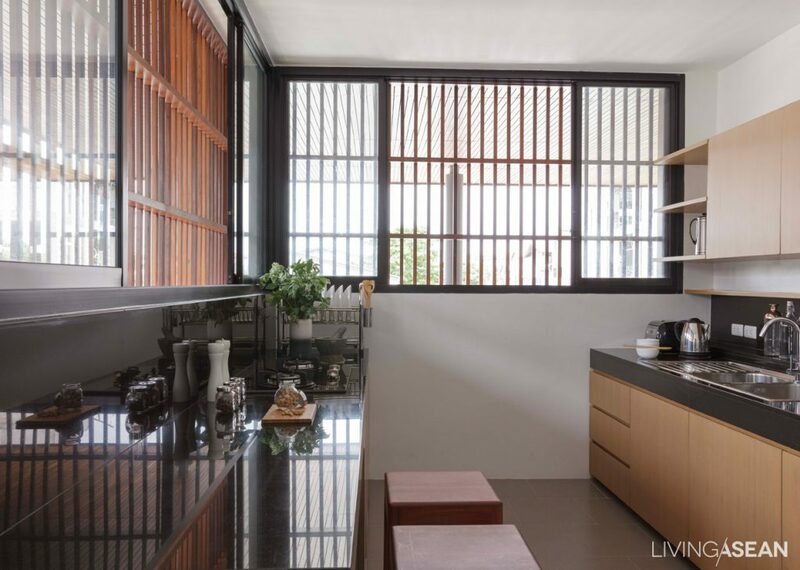 Between kitchen and the studio is a stairway to the second floor and a storage room for Oh’s ceramic dishware. 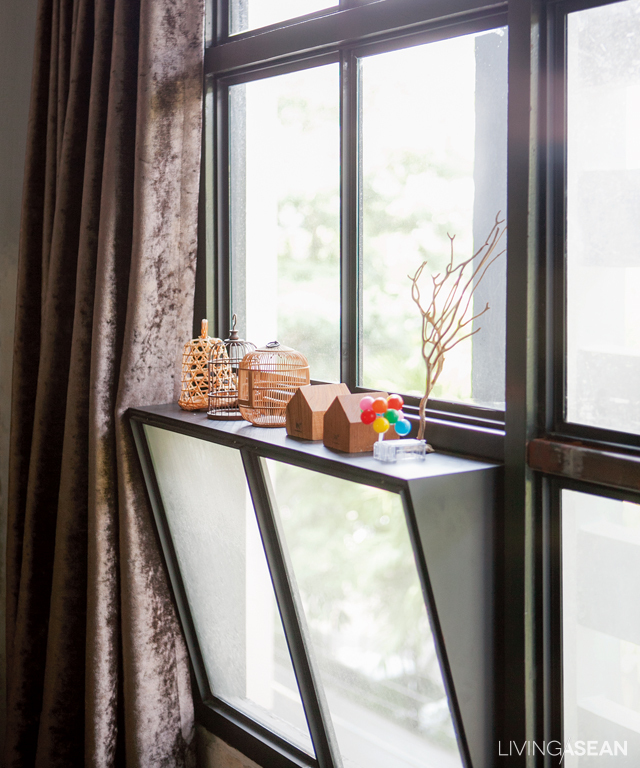 The second floor has a multi-purpose family room, and cool air blows through all the time, making it comfortable for relaxation and sleeping. The roughly finished wood of door and window frames gives a charming rural look, warm and intimate. Windows swing out to reach towards Oh’s mother’s house, making us imagine a cottage, giving a gentle look to what might be a minimalist façade. Behind the multi-purpose area is a bedroom. 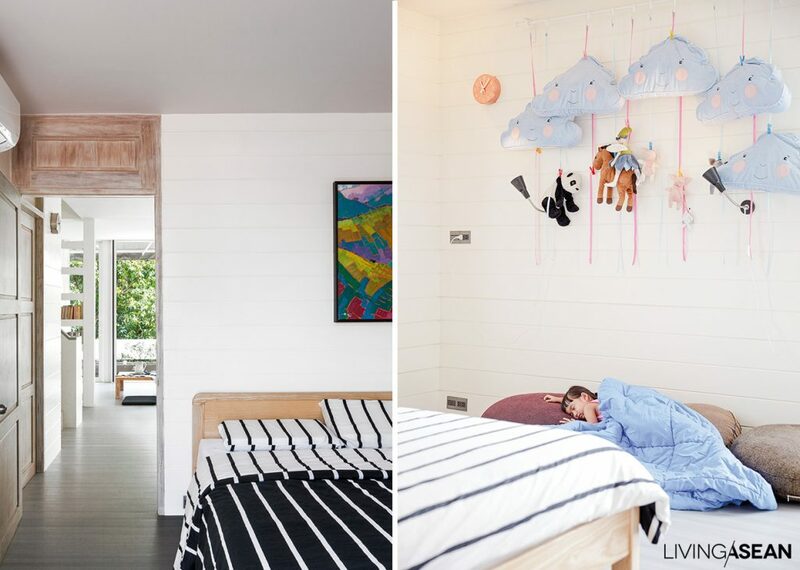 Their daughter still sleeps with her parents, but they’re ready for the future: on the third floor is their daughter’s neat and orderly future bedroom and balcony. 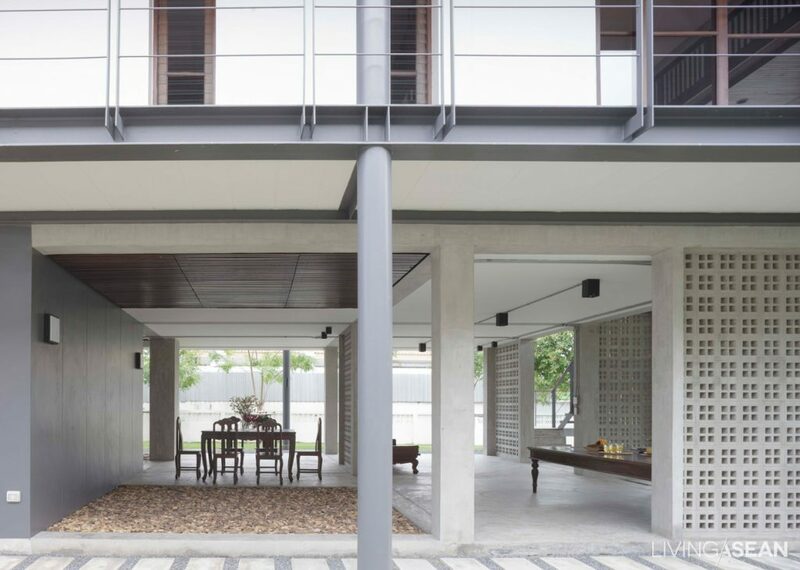 This house is more than a family residence: Oh’s cooking workshops are held here, too. Her focus here is less on preparation of dishes than on understanding raw ingredients and their use. 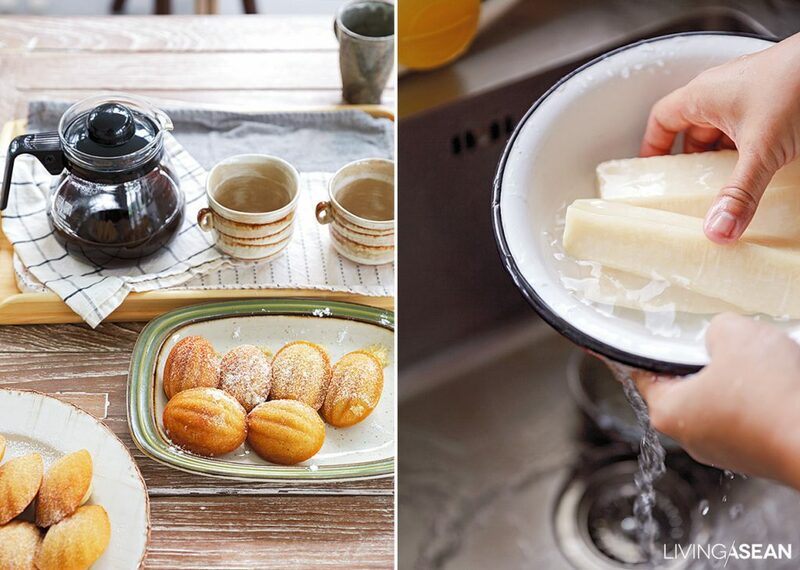 Her food creations are straightforward and easy to follow, and inspire visitors to try them at home. Which ASEAN Countries Most Rely on Income from Tourism? Do you know which ASEAN nations have the largest tourism industry? 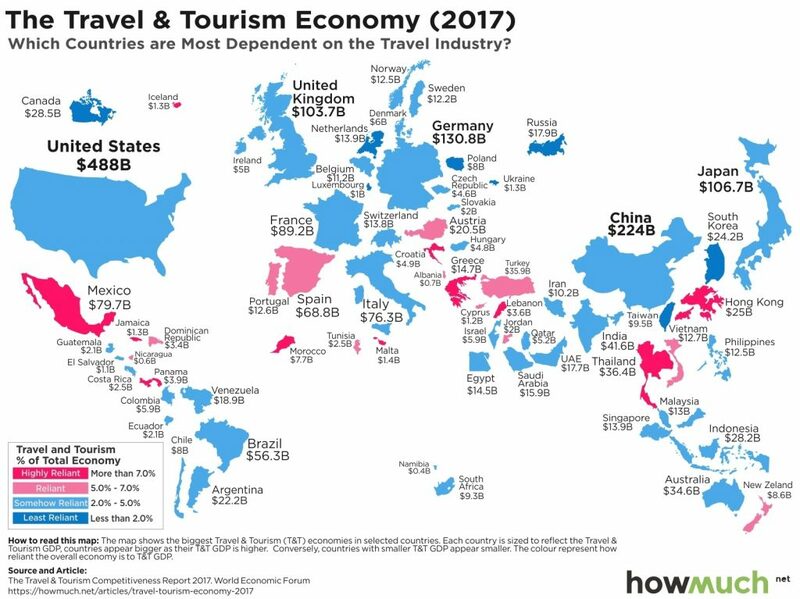 See the map below for the varying degrees of dependency based on the percentage of GDP taken up by the travel and tourism industry. The following are the countries that rely on income from tourism, albeit to differing extents.Red countries are highly reliant with a tourism industry constituting more than 7% of overall GDP, pink between 5% and 7%, and light blue between 2% and 5%. Solid blue countries are least reliant with tourism trade accounting for less than 2% of overall GDP. The Travel & Tourism Competitiveness Report 2017 by the World Economic Forum revealed a growing trend of traveling. On the big picture, selected countries have attributed their economic growth to increased tourism spending. 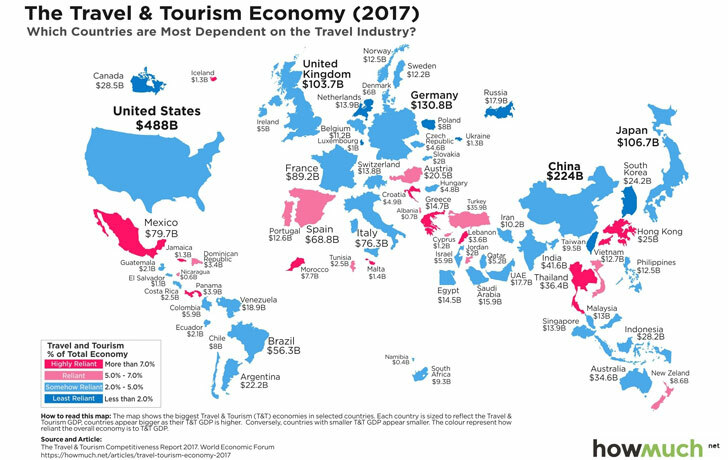 The top 5 nations with the largest tourism industries are the United States whose tourism industry is worth $488 billion, China($224B), Germany($130.7B), Japan($106.7B), and the United Kingdom($103.7B). For the ASEAN Region, Thailand is the largest travel and tourism economy with $36.4 billion. The kingdom ranks third among the top 5 most tourism-reliant countries with tourism trade constituting 9.3% of overall GDP. The report also shows the Travel and Tourism Competitiveness Index which ranks 136 countries worldwide based on their performances on 14 criteria, including safety, ICT readiness, international openness, price competitiveness, and transport infrastructure. Singapore emerges the most competitive among the ASEAN countries and ranking number 13 on the overall index for 2017, followed by Malaysia and Thailand ranking number 26 and 34, respectively. Vietnam makes the list of the most-improved countries in this industry having made great improvements from the last report in 2015. Over all, countries in the ASEAN Region fare badly on the Environment Sustainability Index with only two countries, namely Singapore(number 51) and Laos(98),making the Top 100 Chart. The rest don’t make the cut. They include the Philippines (number 118), Thailand(122), Malaysia(123), Vietnam(129), Cambodia(130), and Indonesia(131). 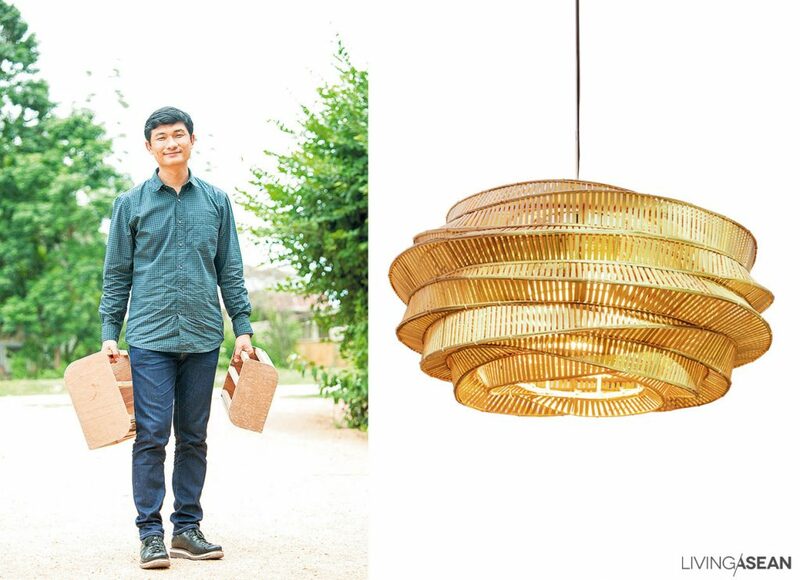 World design is increasingly trending toward handicrafts and elegant craftsmanship, things practically written into the DNA of Southeast Asian designers. 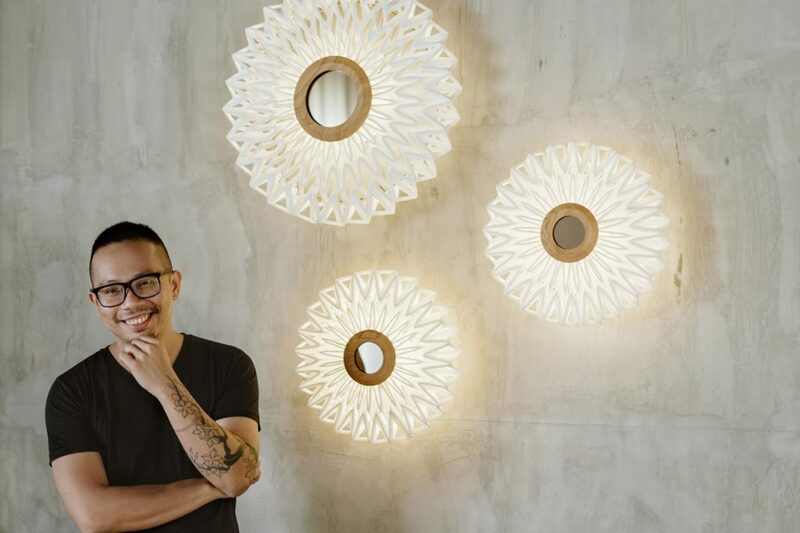 Here we give you 20 contemporary regional leaders who are reinforcing this wave, bringing traditional design into mainstream design. 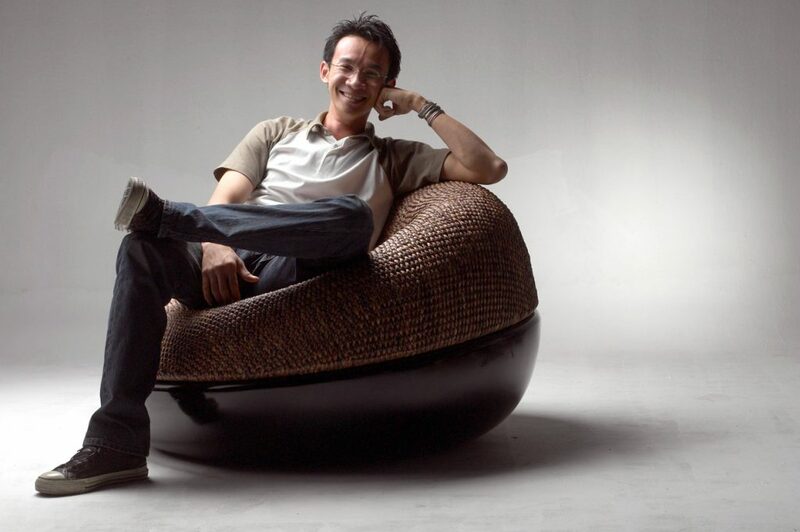 The dynamic Indonesian designer known as Alvin worked with prominent Dutch designer Marcel Wanders before setting up his own product design and interior decoration studio,collaborating with domestic producers of furniture and “alvin-T” decorative items that take a Western approach to Oriental craftsmanship. 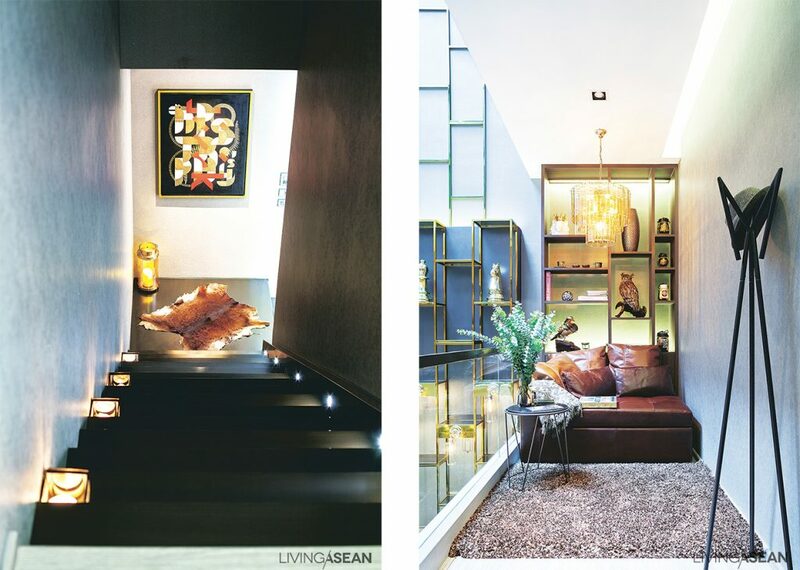 The couple Decha Archjananan and Ployphan Theerachai’s Thinkk Studio is one of the most interesting sources of contemporary design. 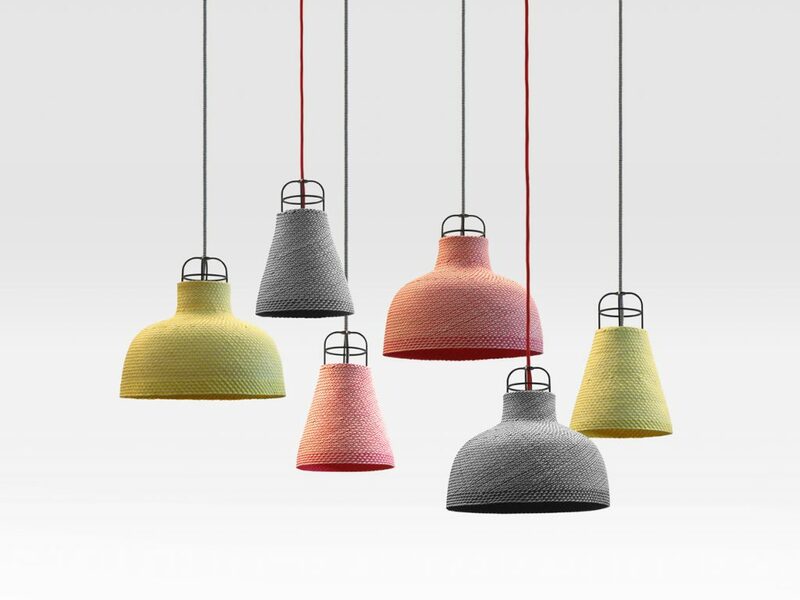 Their production processes unravel the secrets of traditional crafts, bringing them to utility in modern formats that always bear the marks of artistry and innovation. 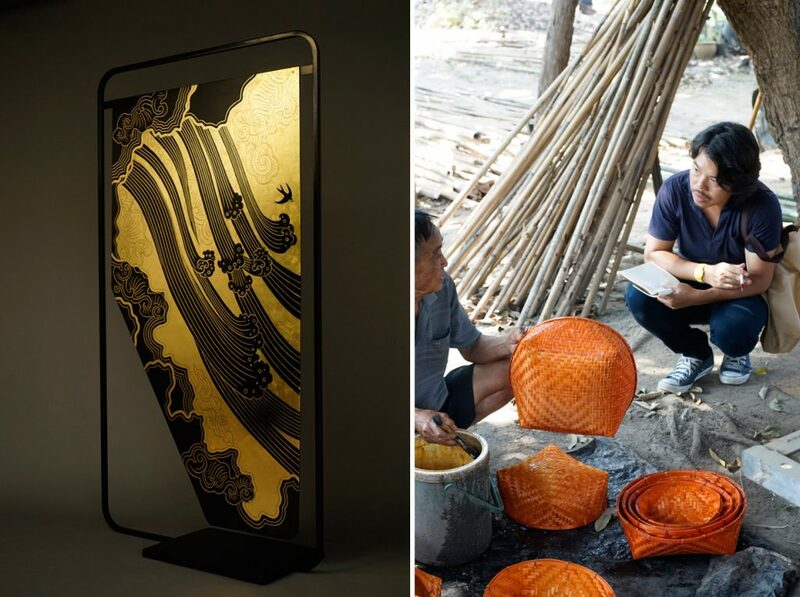 Korakot became well-known through his developing the local art of bamboo work, adapting techniques such as net sewing of Phetchaburi fishermen and ancient Chinese kite construction to produce inventive handicrafts under his own name. 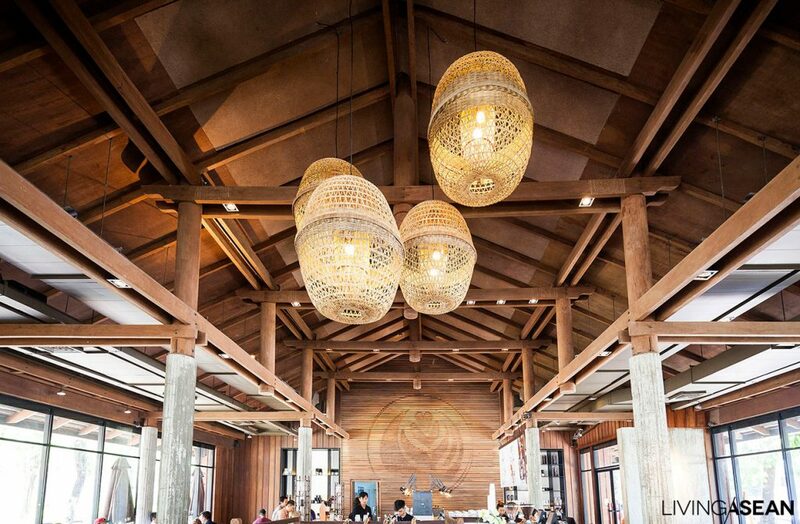 “Korakot” products are on display in residences and hotels all over the world, showing off endless variations of their characteristic elegance. Keep an eye on this designer, for sure! 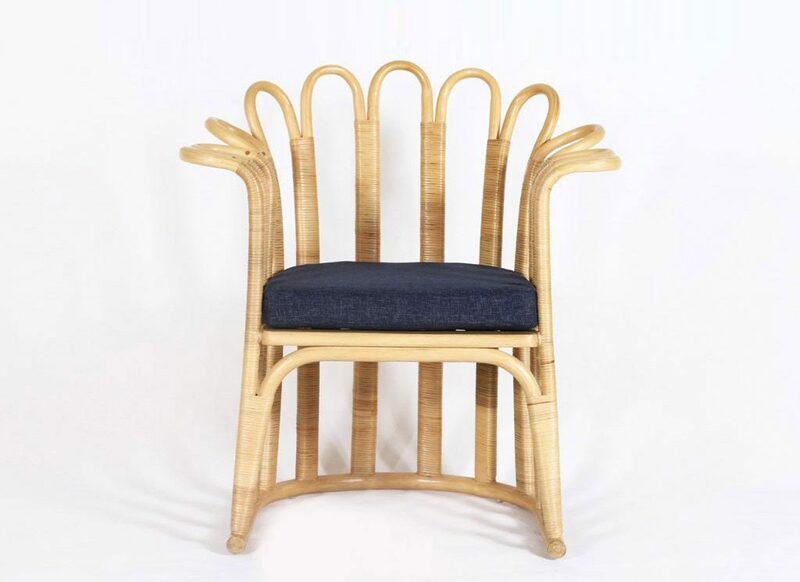 He specializes in rattan work, taking advantage of the worldwide importance of this material for Indonesia. 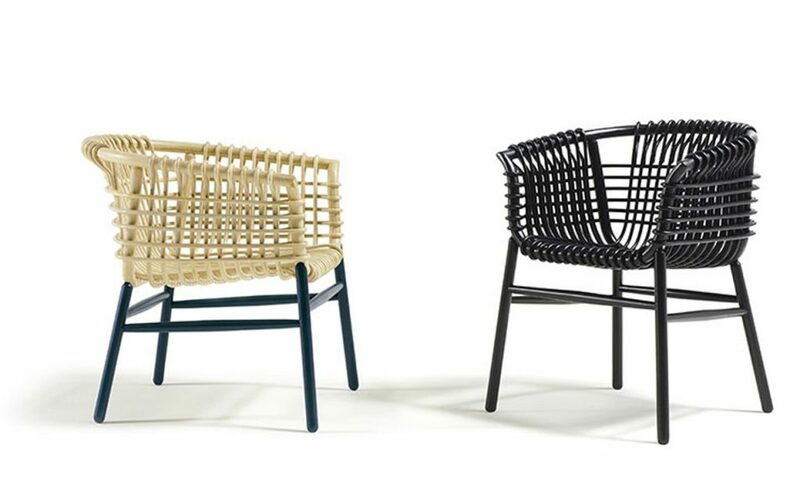 The “Lukis” armchair is part of the 2016 collection for the famous Cappellini brand. 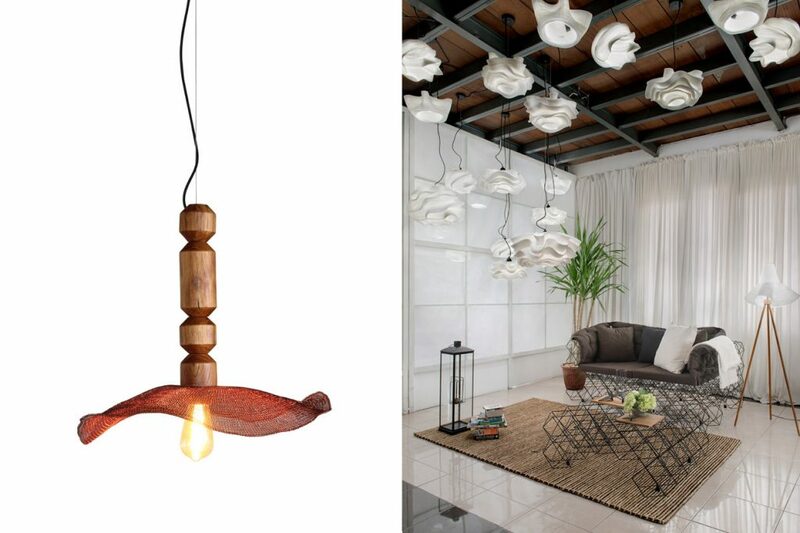 Designer scout Giulio Cappellini previously has helped Tom Dixon and many other well-known designers debut on the world stage. 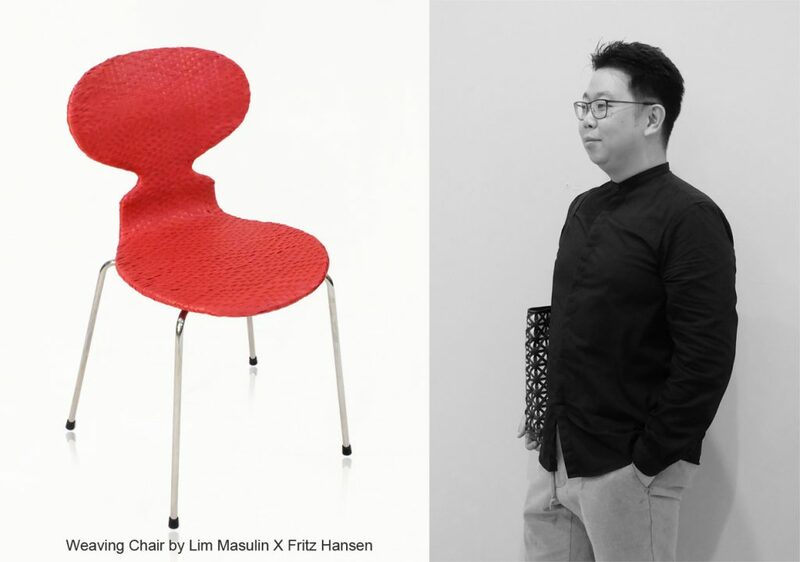 “Gregoria Lounge”brought Filipino design work onto the world stage and gave world recognition to Ito Kish. 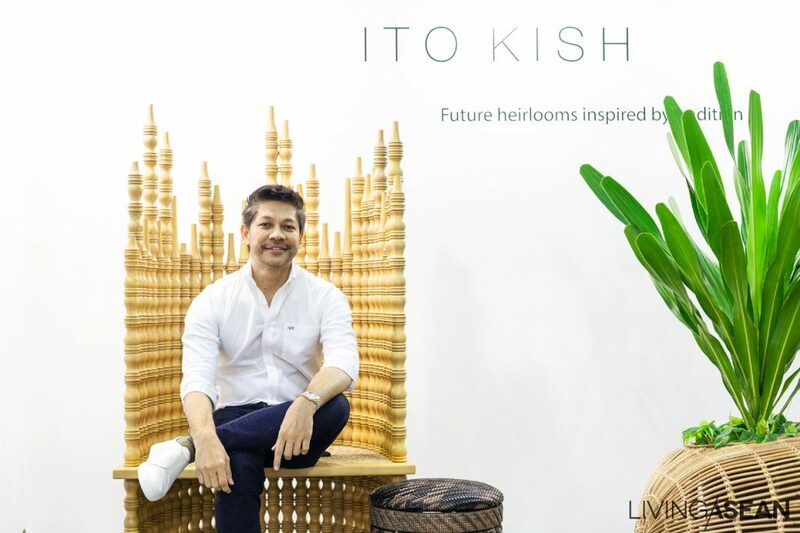 As a child, Ito was fascinated by designs on the gift wrapping paper he used to repair family house walls in their tiny village outside of Manila. 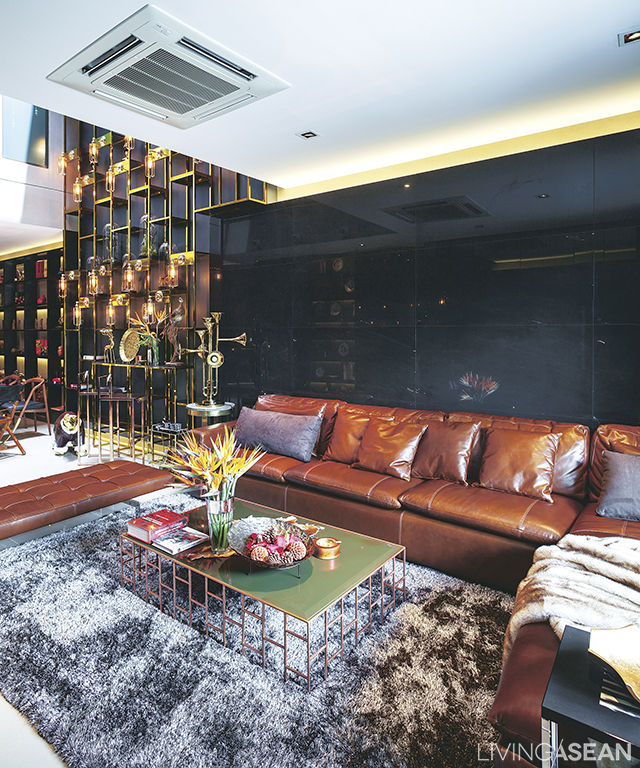 His business in decorative items has now morphed into a leading furniture store – with products bearing his name – which provides interior decorating services for his fans. A beauty of light and shadow born of intricate welded lines stands out in both structure and detail as an impressive representation from this modern craftsman and expert metal worker. 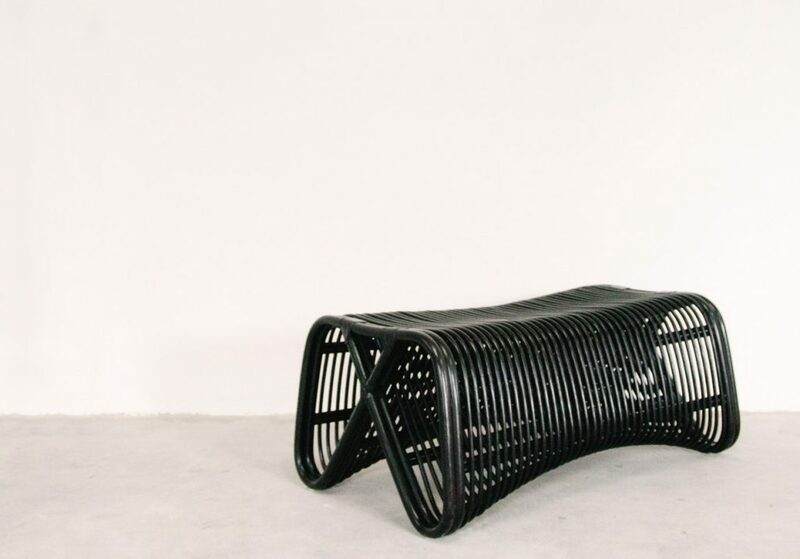 Jitrin’s works are continually in demand, most notably from his own rattan furniture brand “Corner 43,” whose trademark gentle curves are naturally suited to contemporary forms and which has evolved steadily over the fourteen years of its existence. 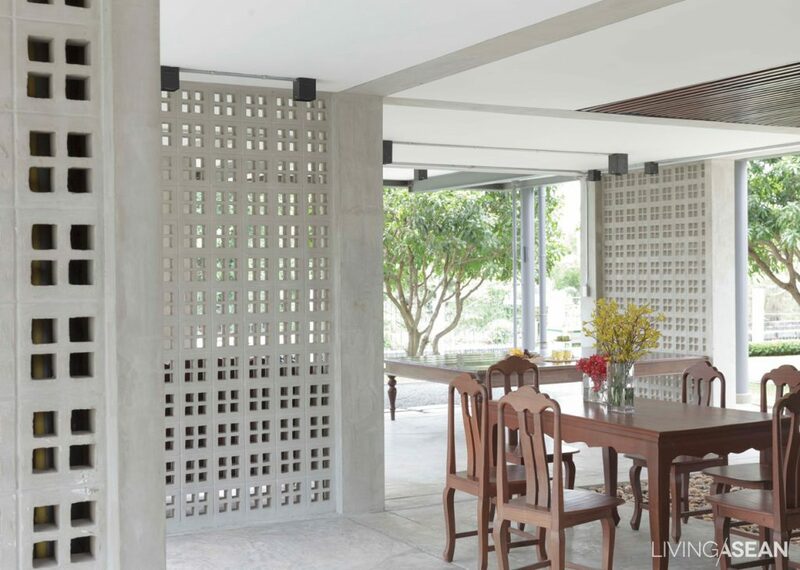 From his infatuation with the weaving work produced by Indonesian artists, highly valued in the West, Lim Masulin and his BYO Living Company collaborated with famous domestic architects to scale up the concept to an architectural level and produce fascinating “woven” coverings for buildings. 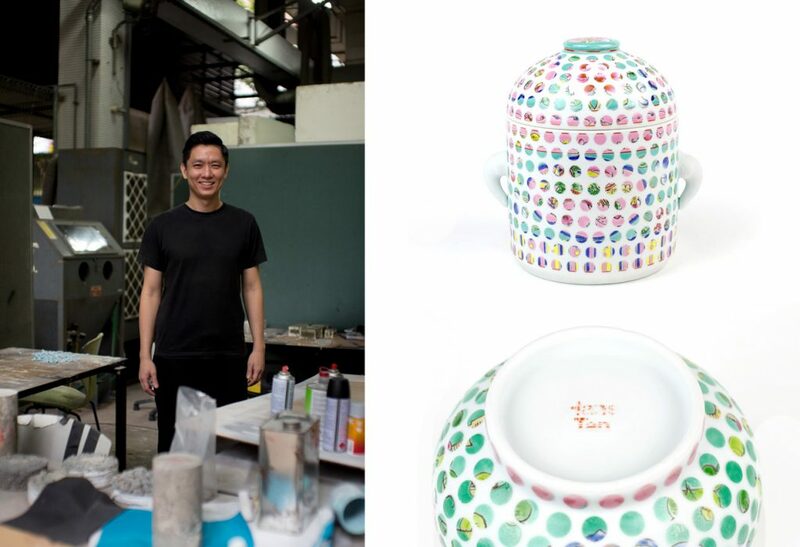 In the colorful piece entitled “Spotted Nyonya,”Hans Tan presents a uniquely Singapore narrative. 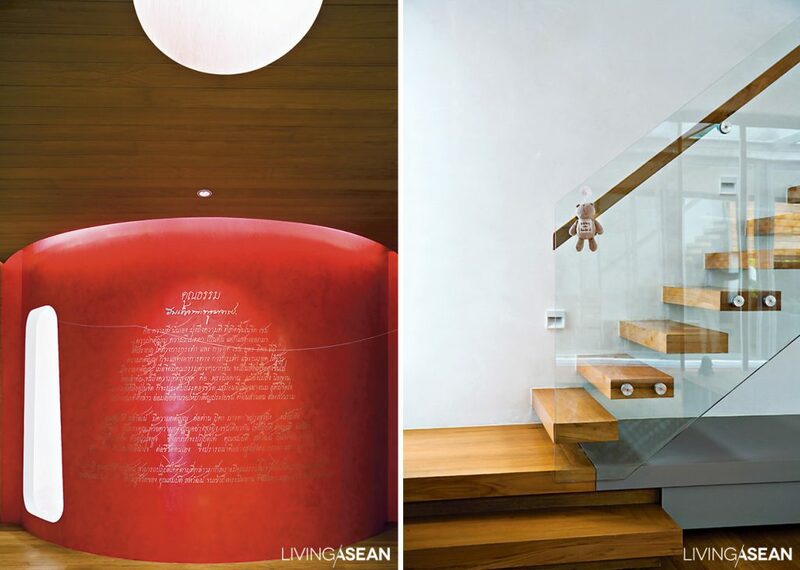 “Nyonya” refers to the Singapore heritage mixture off oreign and Malay Peninsula cultures, evident here in a contemporary design context. 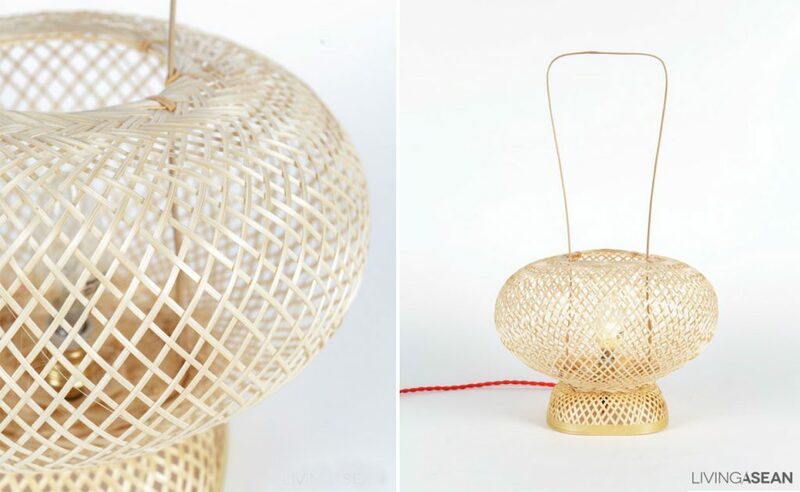 “Ong Cen Kuang” is a brand of lamps from Bali founded by Budiman Ong, whose stellar career was founded on sewn forms of cloth and origami-style folded paper fashioned into contemporary articles that display warmth, gentility, and a delicate openness. Everyone living together in a warm communal atmosphere makes this wood house a true family home. 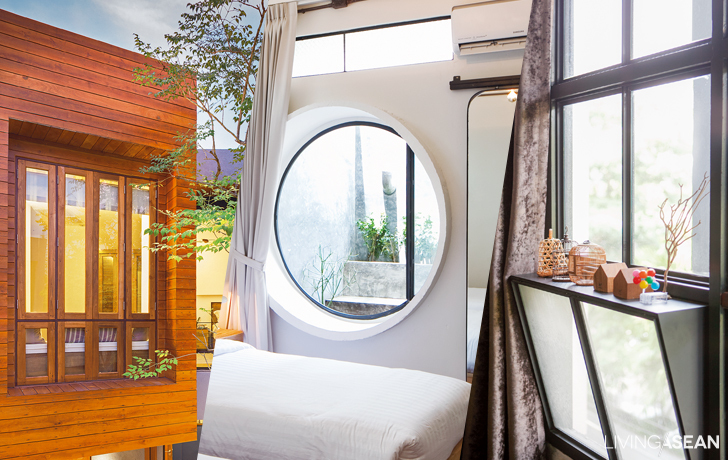 Story: Jeadwonder /// Photography: Sitthisak Namkham, Piyawuth /// Design: Spacetime Architects Co.,Ltd. Mother and her younger sister live in the left wing. Behind is the parking area. Spaces are separated with drapes that can be rolled up and put away to create a common space for big family dinners. 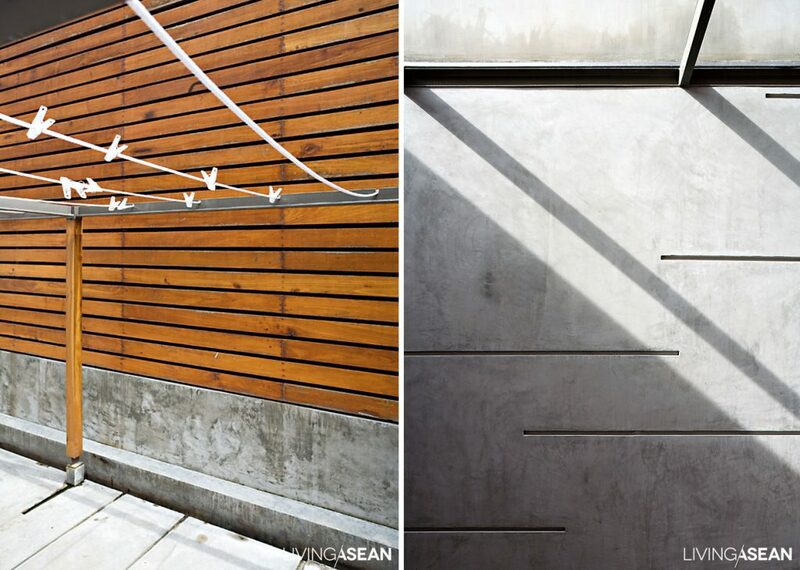 Teak wall and outdoor connection of mother and younger sister’s house. Young married people these days tend to move away to have children and live separately, but Chang (Somprasong Sawat) and Bua (Buachomphu Ford) have brought their family back home. “We’re all one big family, Mom, my sister, and my family, which right now is me, Bua, and our three young sons. It’s comforting to have relatives nearby. Grandma and Auntie help with the grandchildren,” Chang says with a smile. 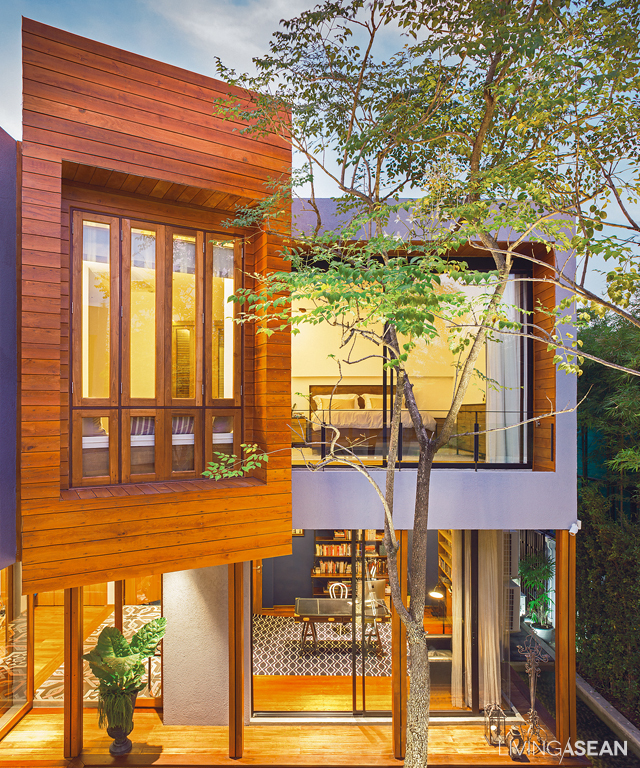 Kanika Rattanapreedakul designed the house: Chang had learned about her work from a magazine article about house design in New York’s Soho district, where Kanika was the single Thai woman featured among a number of Westerners. 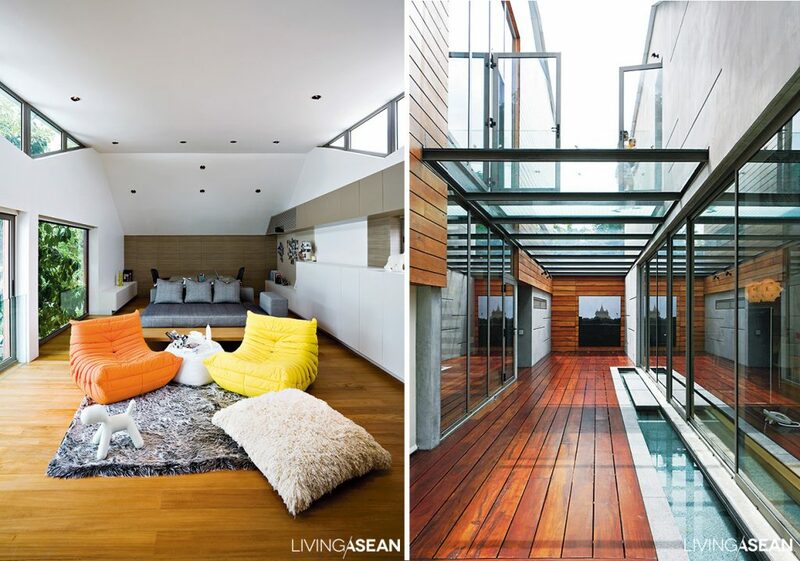 Her design resulted in this unique 1,000 square meter home, divided into three main sections. The first part, in the center, holds the swimming pool and central area of the house: living room, dining area, and Western-style kitchen. This is everyone’s common area. Dining area and light-use kitchen. Chang and Bua’s parlor, used for a meeting room or just to socialize. 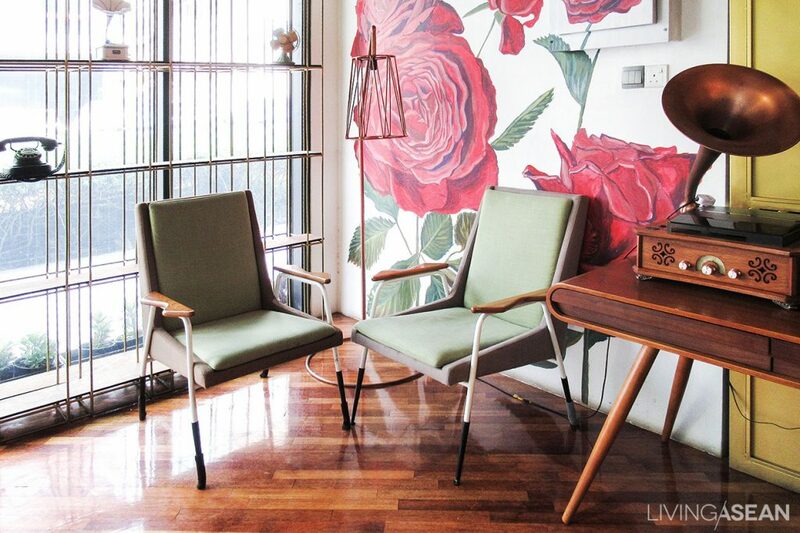 Fresh red tones enliven Chang and Bua’s living room. Left: Chang’s sister’s private kingdom. Right: second-floor glass corridor on the second floor connects Chang’s house to the central area. 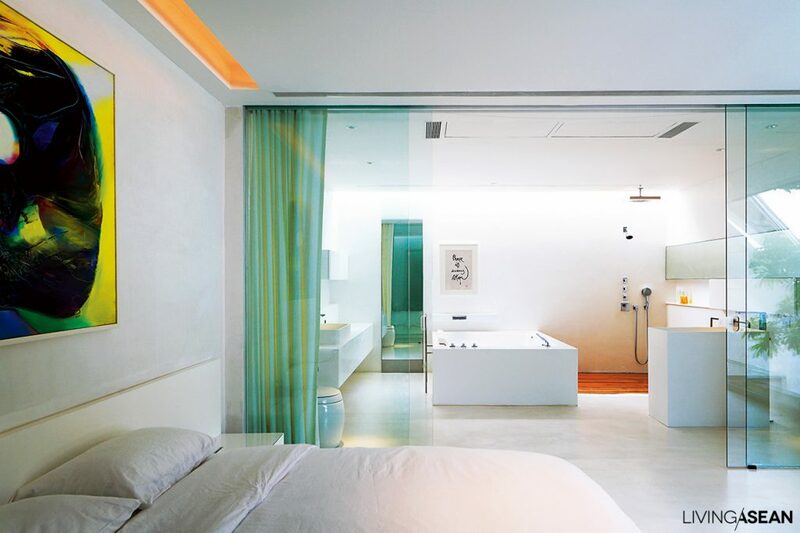 Chang and Bua’s art-gallery bedroom connects to a spacious white bath. 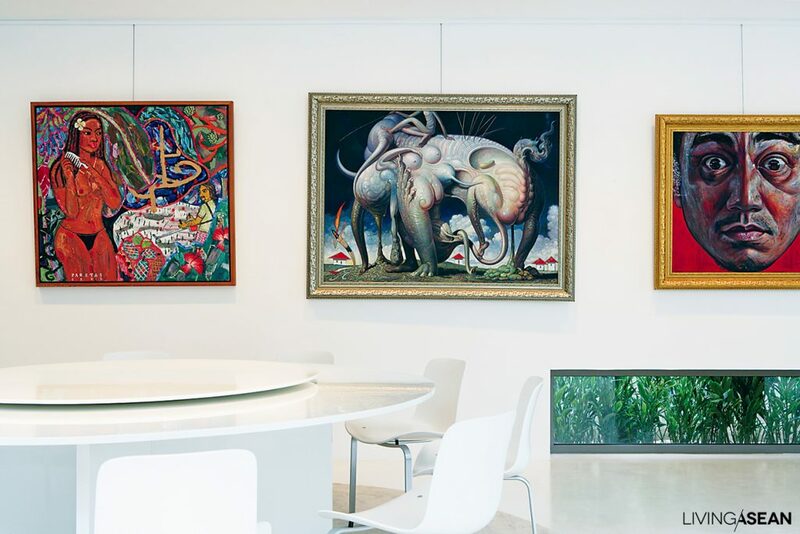 The ground floor next to the pool has a reception area for guests, decorated with Chang’s art collection and next to a glass room where Bua practices yoga or sons play with friends, neighbors, and relatives their age. The second floor is a mezzanine, with young Matt’s bedroom and a small pantry. Finally, on the third floor is Chang and Bua’s bedroom and two more small rooms for the children as they get bigger. 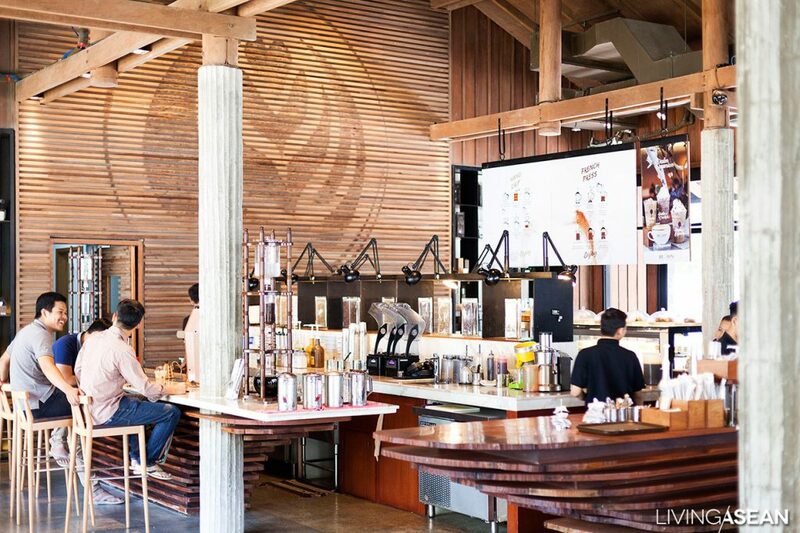 Not only is it Instagram worthy, but it’s also hip to be part of a thriving café culture. 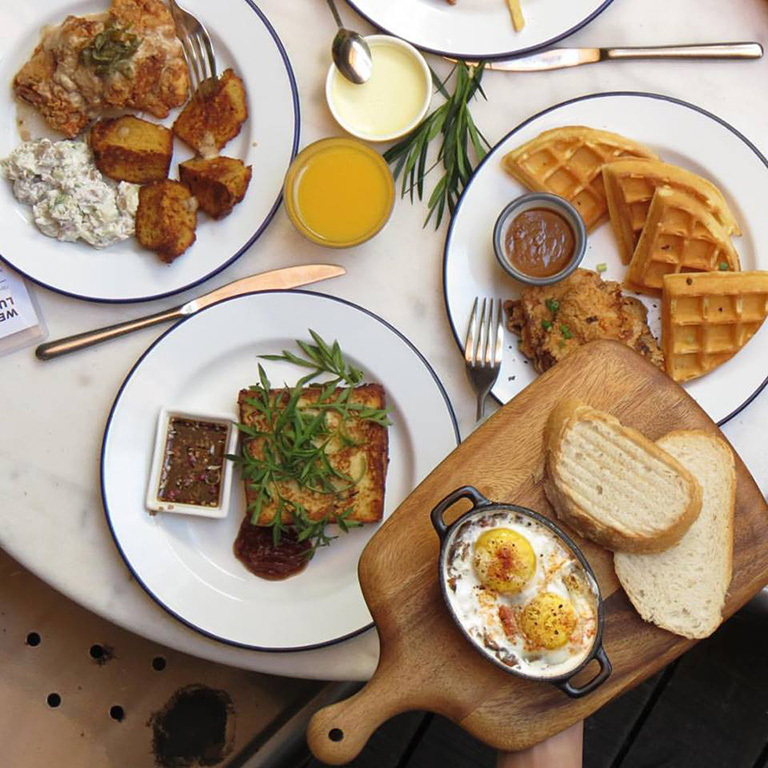 Next time you’re in Kuala Lumpur and Selangor, here are ten cafés to chill out with a cuppa and post your best OOTD shots. 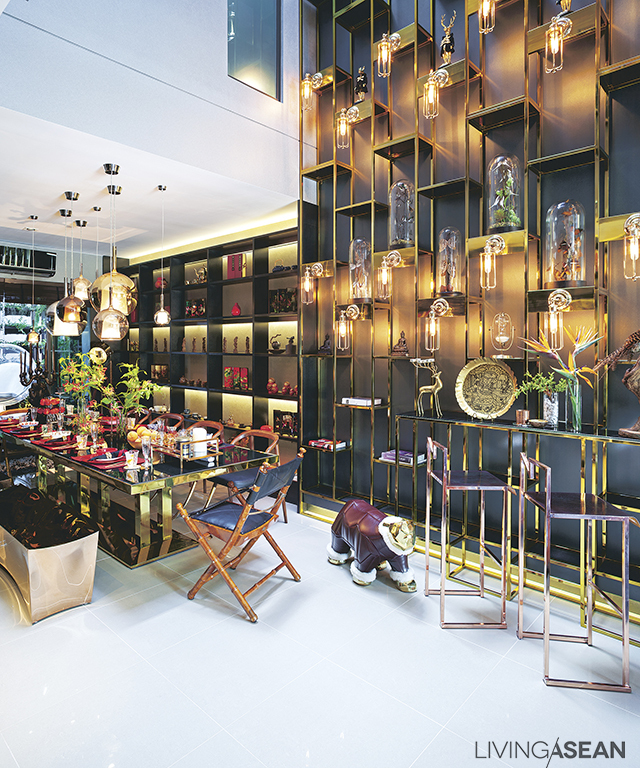 Its location in bustling Chinatown serves as constant inspiration in defining this stylish café’s aesthetics. 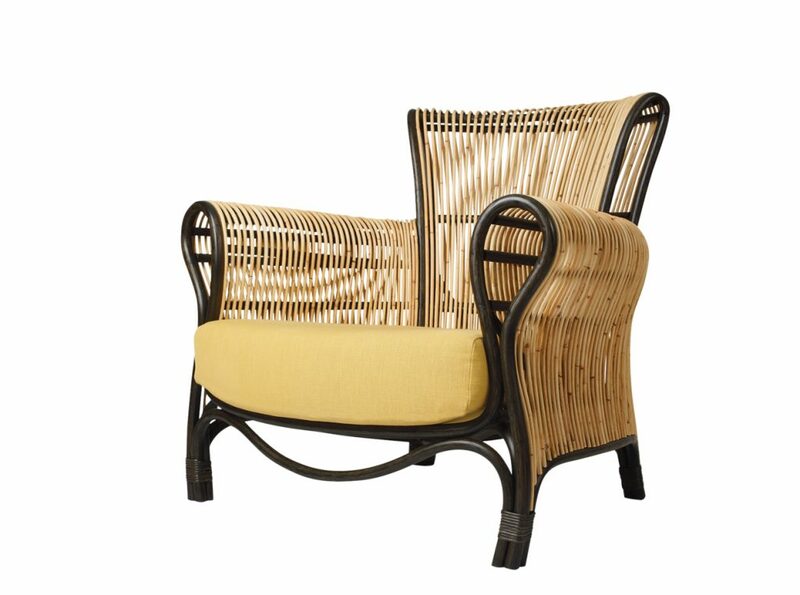 The phenomenally popular Merchant’s Lane is known for its vintage touches, most apparent through its traditional rattan chairs. 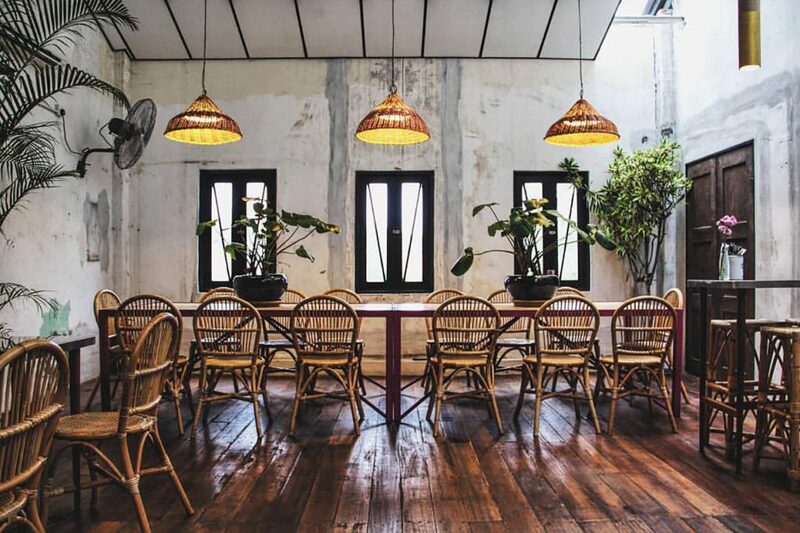 The upper level, a beautiful blend of traditional elements and modern touches, provides more space to cater to the quaint café’s ever-growing number of fans. For more information on Merchant’s Lane, click here. 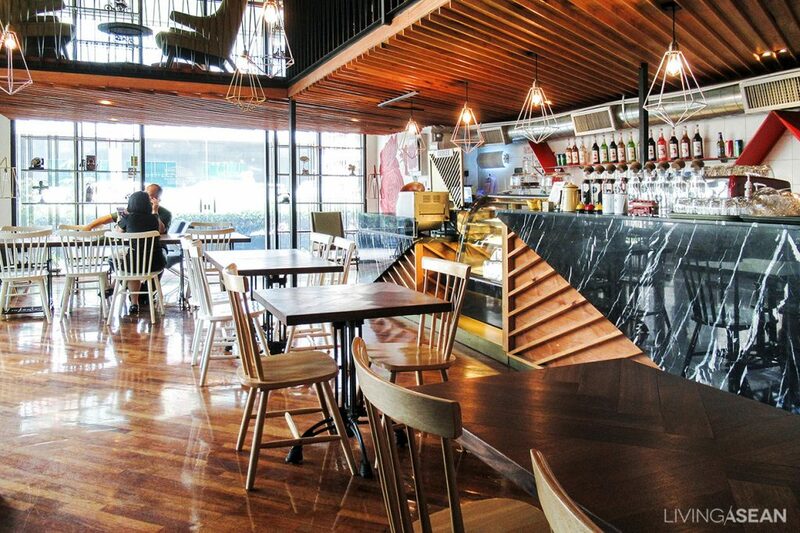 Its namesake alludes diners to the café’s contradicting yet complementing elements. 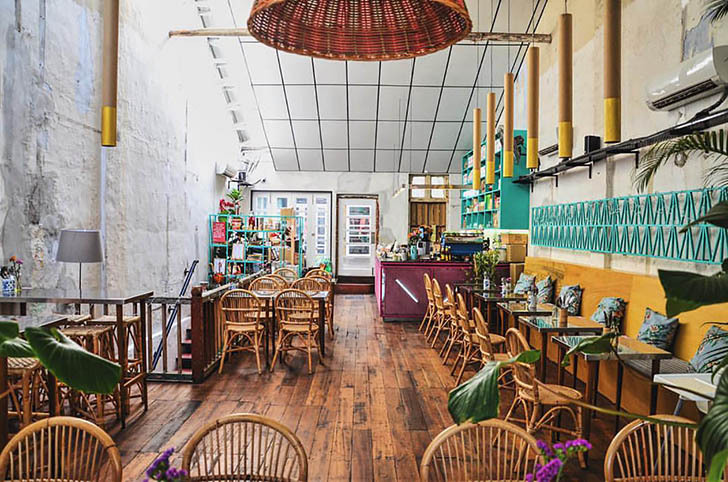 The heavy use of wooden panels on the walls and floors are cleverly contrasted with floral murals and pops of color from the Scandinavian-inspired furniture, giving the space a warm and welcoming vibe. 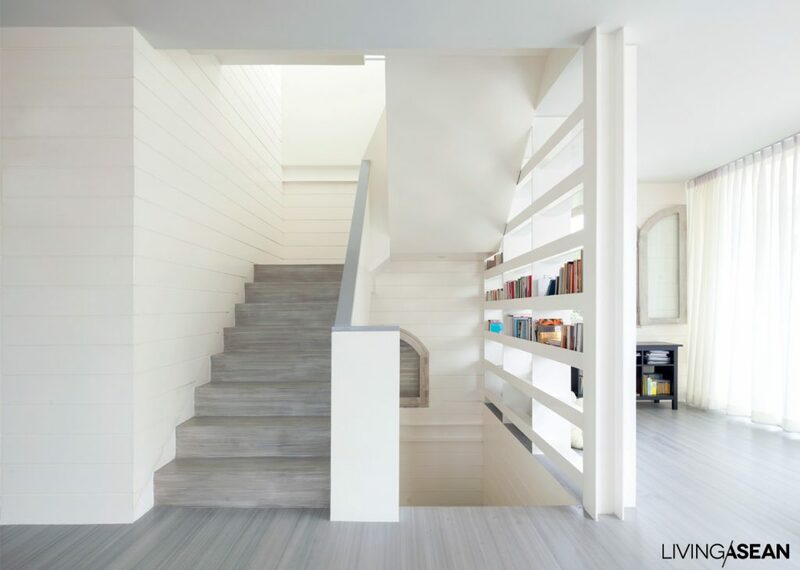 The upper level uses mirrors to make the narrow space appear roomier. Meanwhile, those enjoying a cup of latte at the outdoor area may be tempted to take a wefie or two against the iconic exterior walls. For more information on Peter & Mawar, click here. 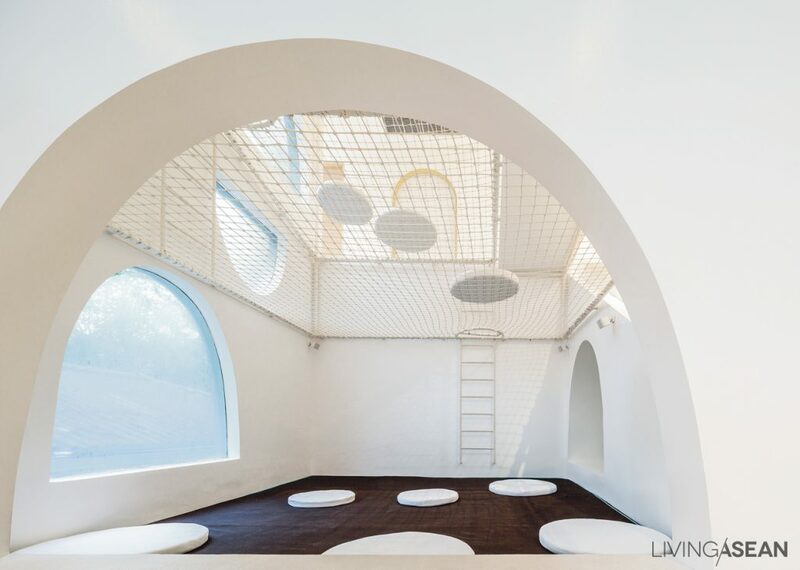 A step into this minimalist café evokes the feeling of stepping into someone’s home, in line with the café’s concept of serving home-style Japanese food. 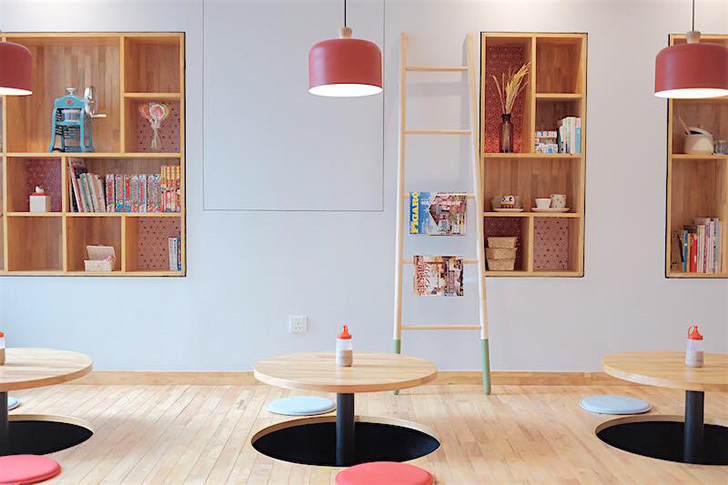 The sunken seating is a refreshingly unique feature and blends perfectly well with other quirky elements in the café, from the magazines hung on the ladder to the colorful display of kitschy collectibles on the open shelves. 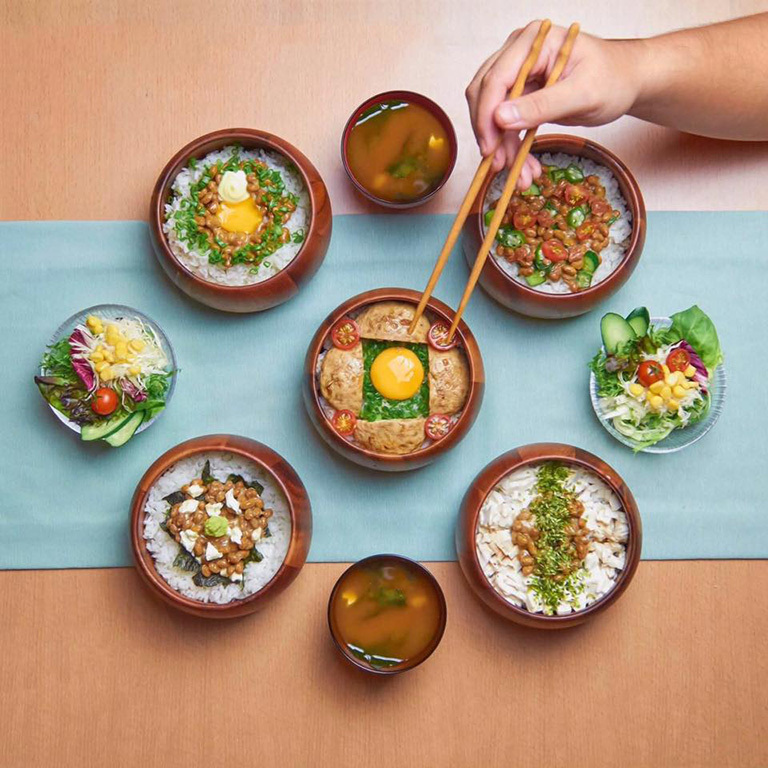 The beautifully modern Nippori celebrates food through its eye-catching dishes, serving up neat, perfectly-arranged bowls of steaming rice and fresh salads. 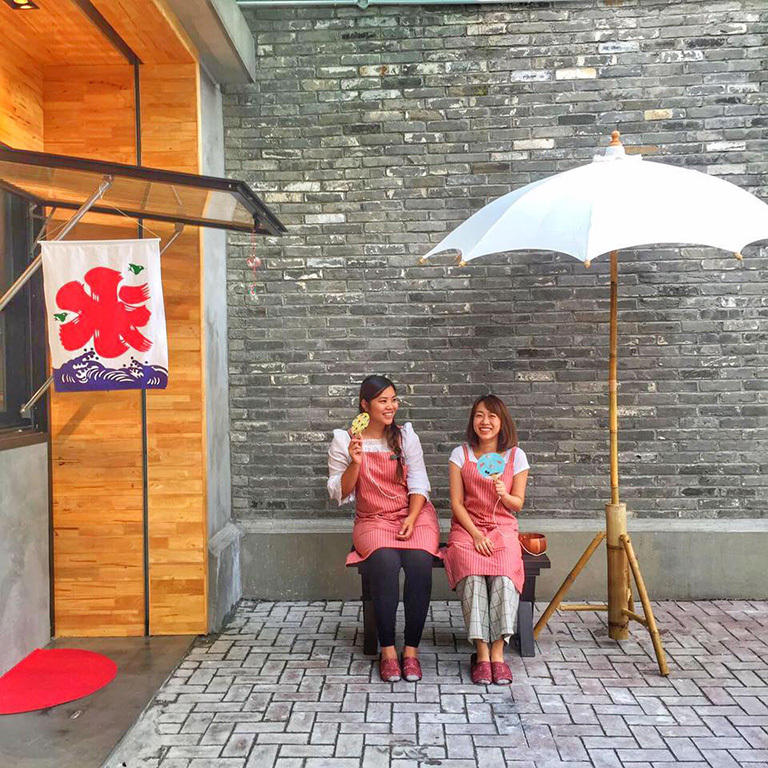 For more information on Nippori, click here. 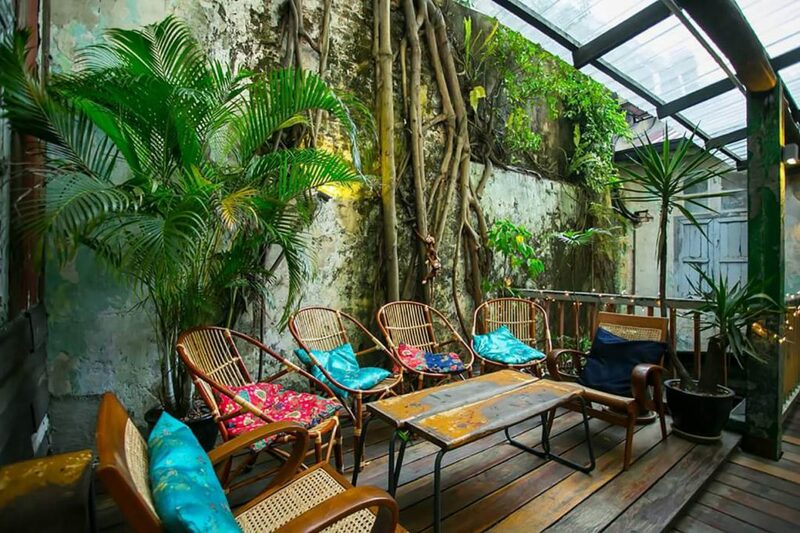 Sharing a courtyard with popular backpacker spot BackHome Hostel, this cute compact café sets itself apart from KL’s long list of hipster joints by including top-notch local coffee in its menu. 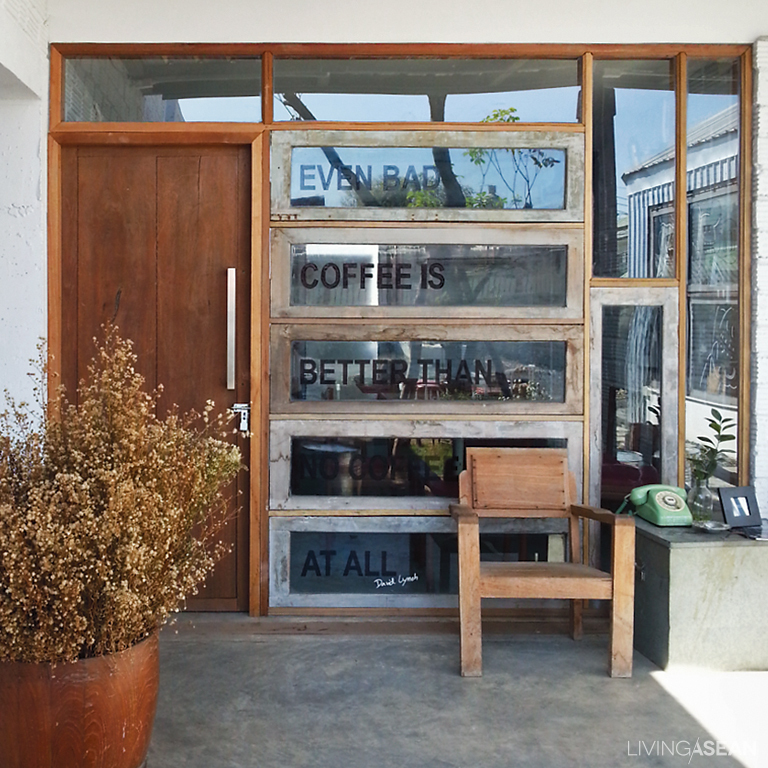 Its signature lightbulb-lit sign serves as a beacon for passers-by, tempting them to make a pit-stop for a rich cup of coffee. 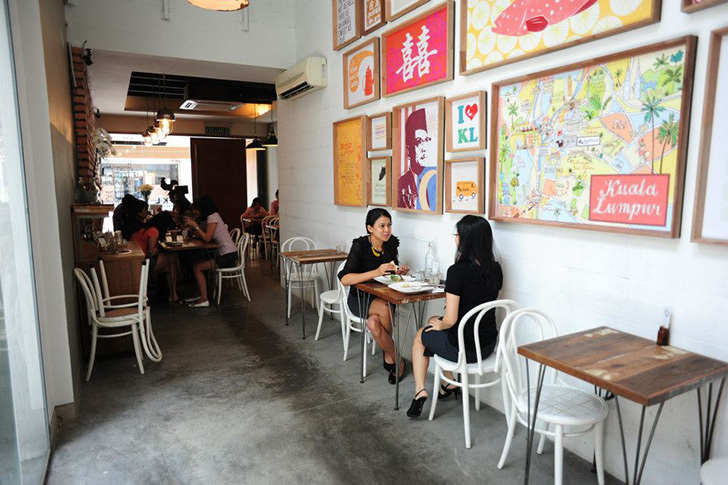 LOKL proudly proclaims its love for Kuala Lumpur through the iconic posters hung on its feature wall, often serving as a vibrant backdrop for OOTD shots. 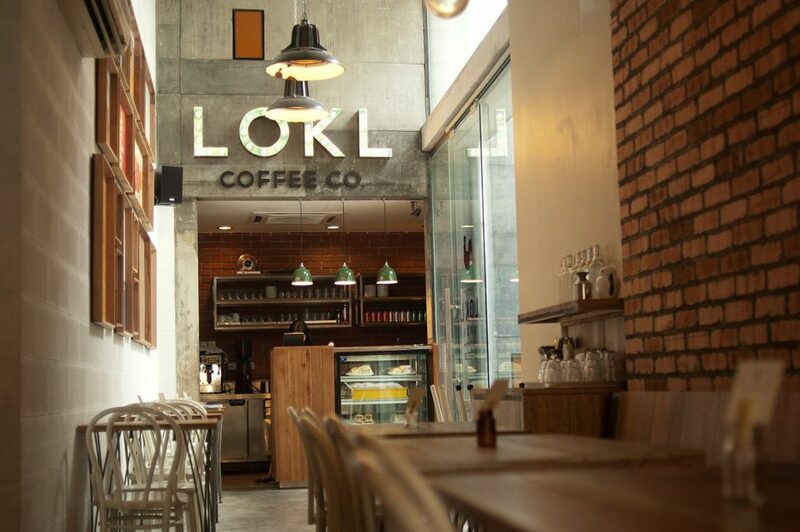 For more information on LOKL Coffee Co, click here. 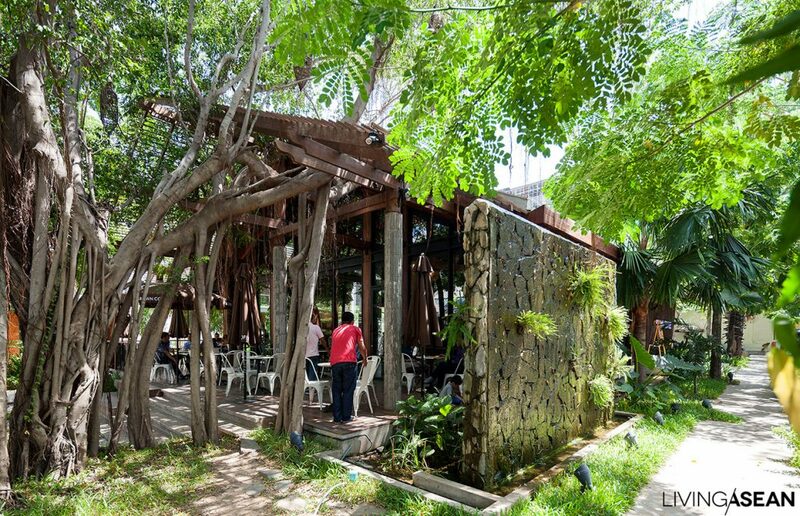 Lush greenery is prominently featured at this hip coffee joint, starting from the mini rainforest adorning its entrance. 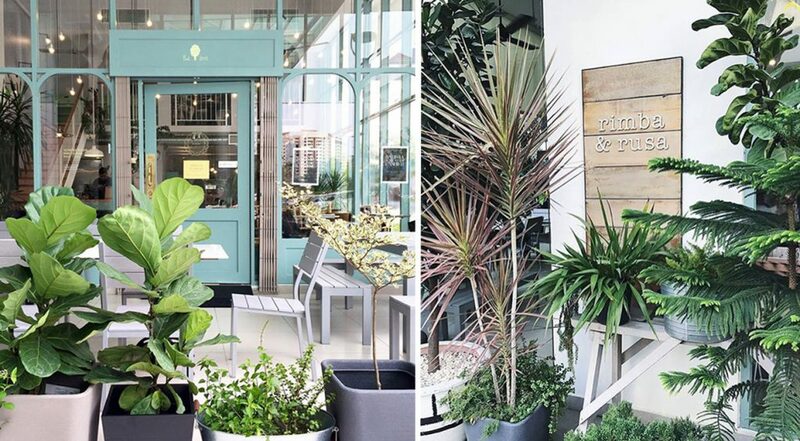 Mint-colored accents used throughout the café is a welcomed complement to its collection of live plants, creating a cooling retreat from the city’s hot and humid weather. The pretty desserts showcase, neatly displayed using see-through cake stands, is the first to greet diners stepping through the entrance. 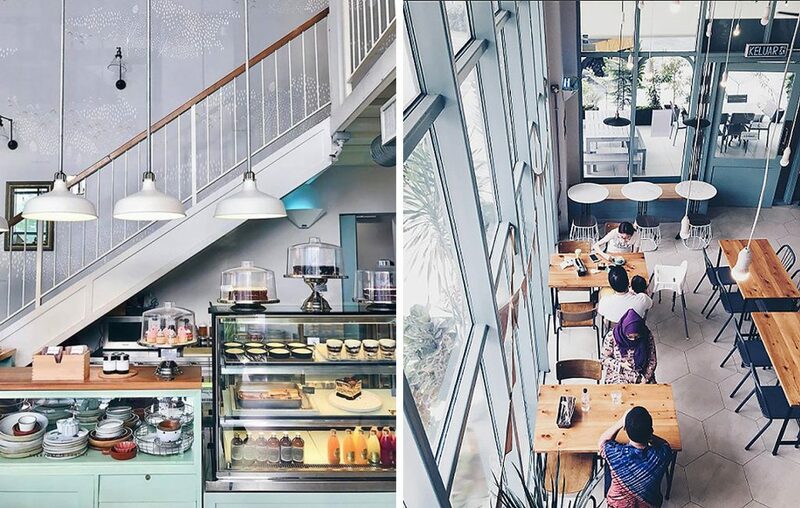 Pick your favourite cake, grab a seat by the ceiling-to-floor windows and watch the world go by. For more information on Rimba & Rusa, click here. 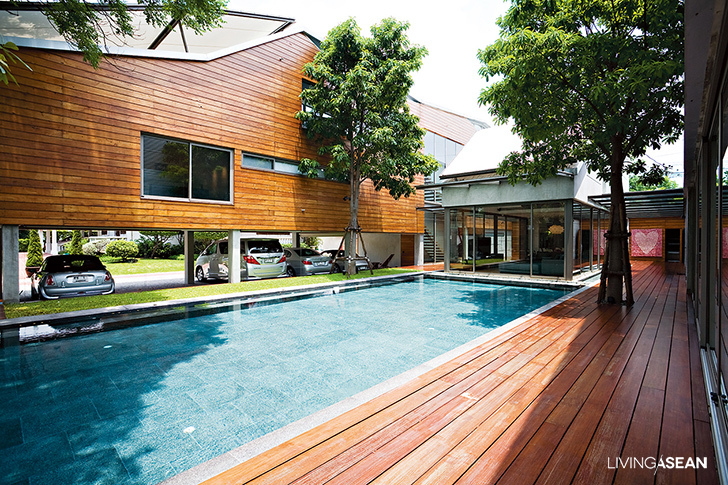 Looking anything but traditional, this modern house celebrates the airy ambience emblematic of Thai-style architecture. 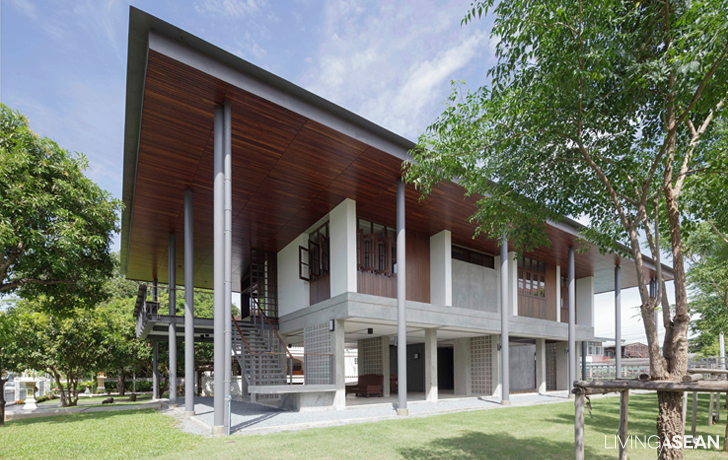 Her beloved Thai-style home was damaged by massive flooding that inundated much of Thailand’s Central Plains in 2011. Love never dies. 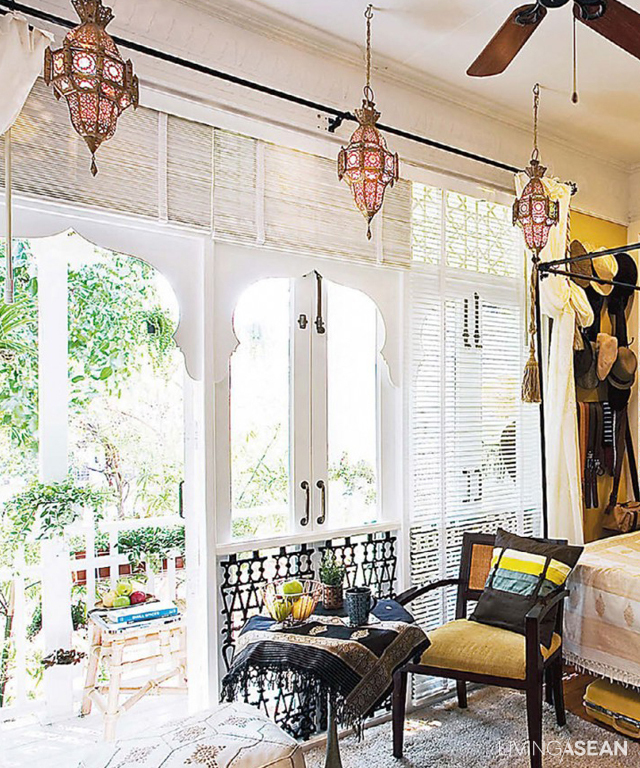 The owner had it torn down to make room for an entirely new home with all the charm and character of Thai-style residential architecture. 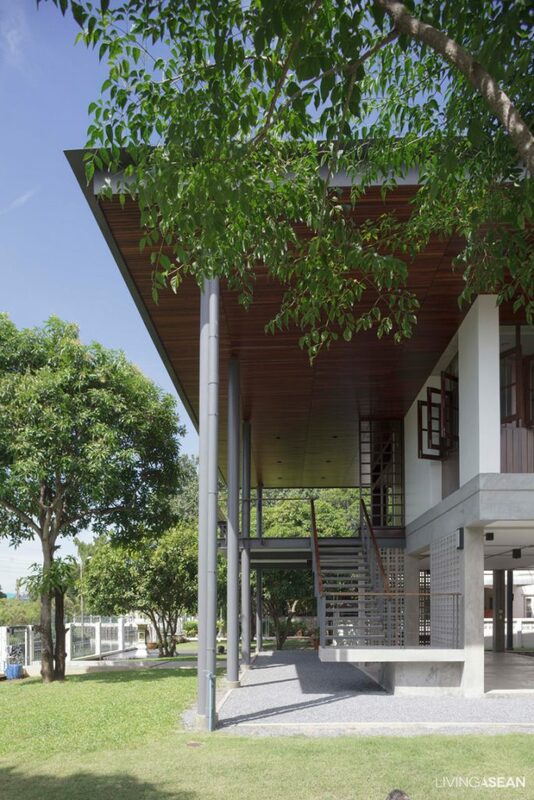 Fulfilling the owner’s needs, the team of architects came up with house-on-stilts design with extended overhangs. 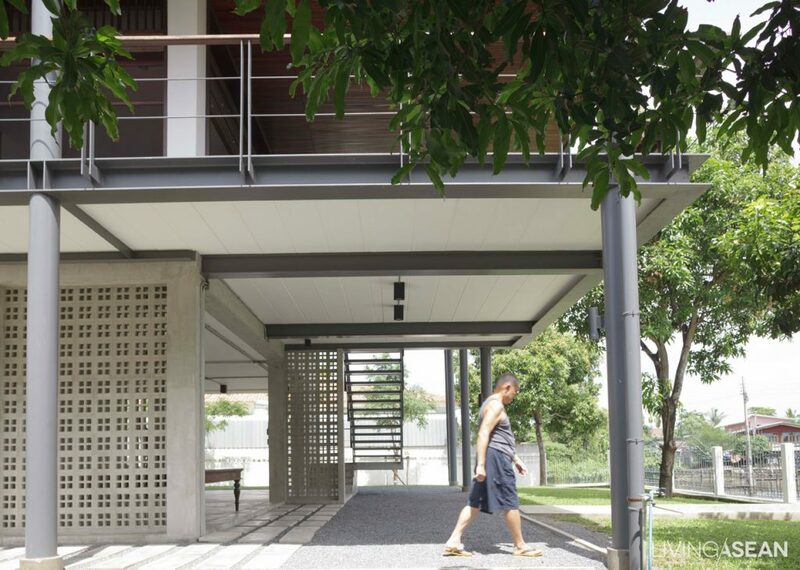 It was crafted of a mix of concrete and steel beams for durability. Proper building orientation allowed the new home to reap the full health benefits from cool breezes blowing in all day from a nearby canal. The architects put in large openings, such as sliding doors and windows, along the sidewall facing the waterway. In the meantime, air vents are put in on the opposite side to facilitate natural air circulation in and around the building. In so doing, they were able to eliminate the needs for mechanical air conditioning entirely. 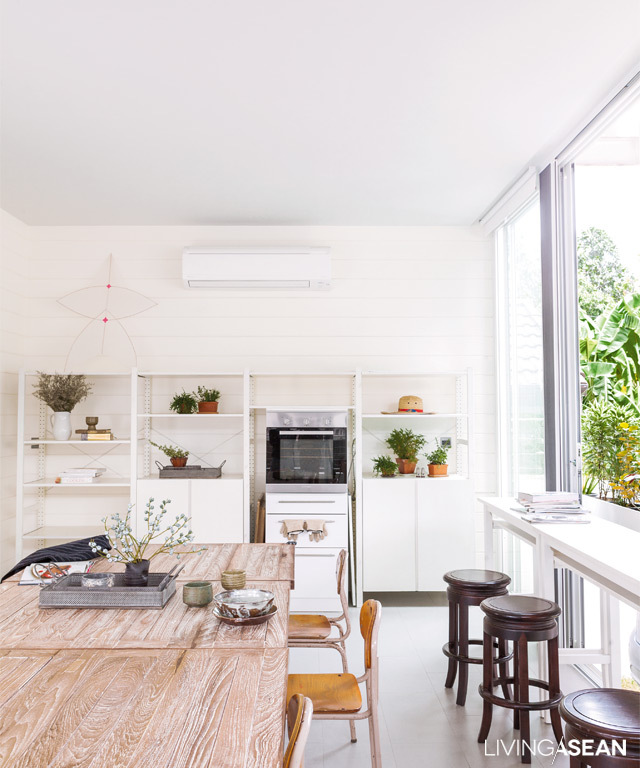 To ensure nothing goes to waste, timber and other leftovers from the old house were adapted for reuse in new purposes, such as ceiling panels, windows, handrails, and benches, even kitchen cupboards. Reclaimed timber with weathered looks not only added classic appeal to the new house, but also served as sentimental reminders of the old building that had been the family home for many years prior. The new house may look anything but traditional. 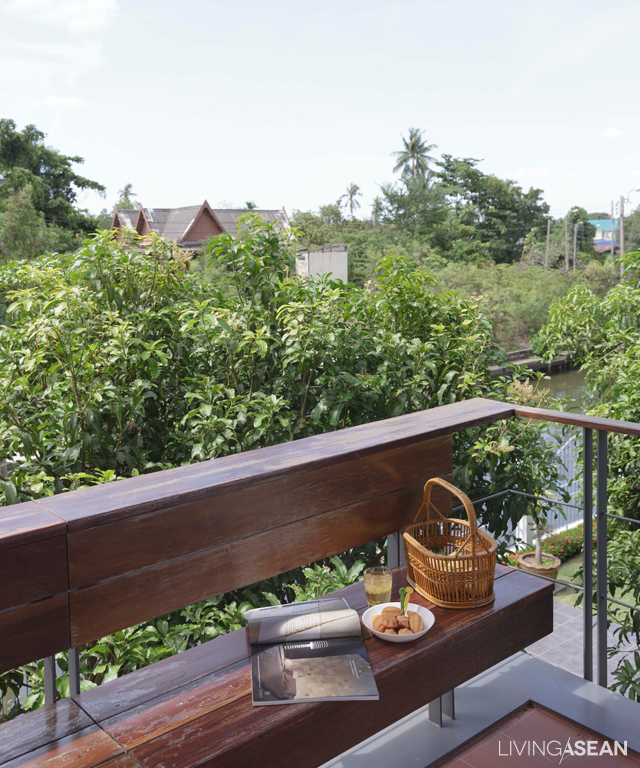 But like Thai-style homes of the past, this one is designed for the Tropical climate and well positioned to maximize certain aspects of natural surroundings, from street appeal to views of the nearby waterway. 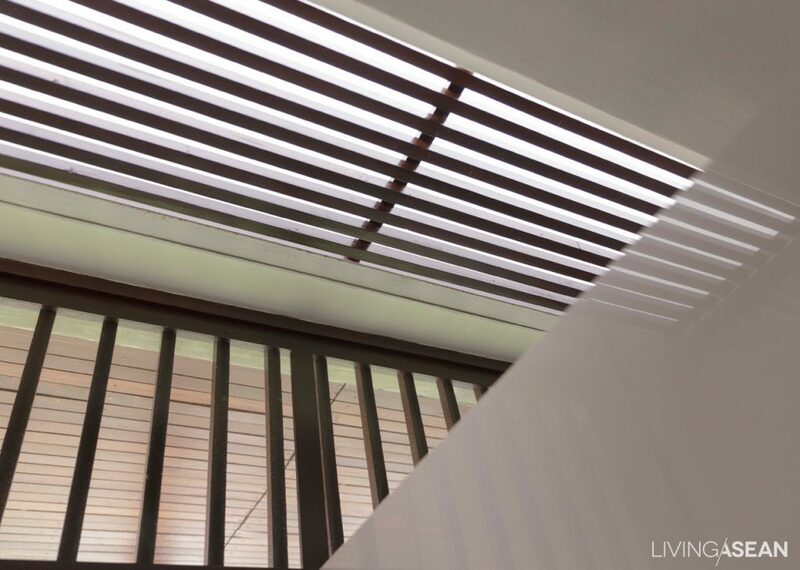 Part of the air vents designed to promote natural air circulation. 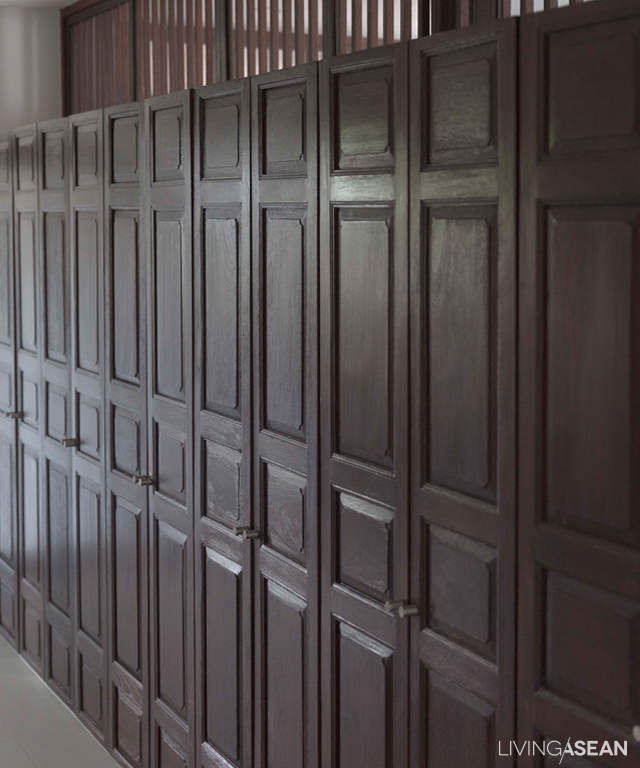 An array of wood cabinet shutters was adapted from old folding doors before the flood hit in 2011. 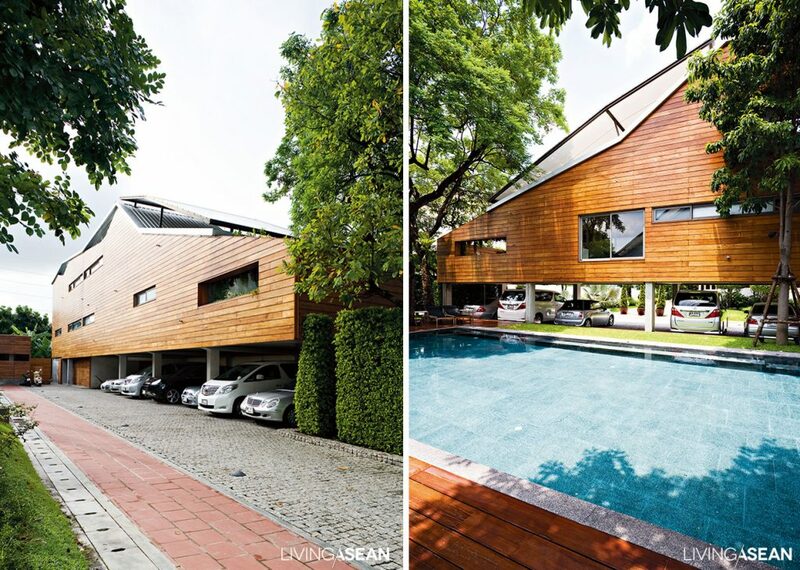 The standard concept of “townhome” gets thrown out the window the minute you see this exotic oriental home. 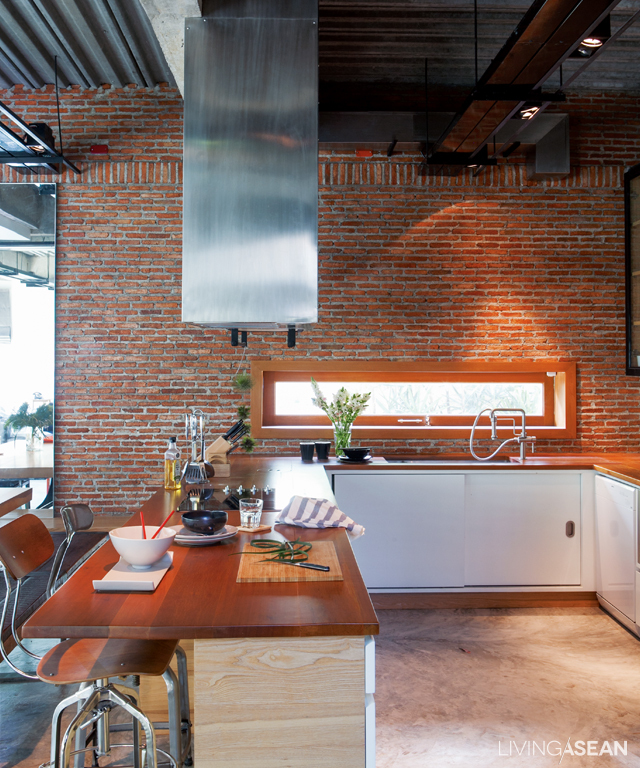 Owner/Designer: Pantavit Lawaroungchok of Apostrophy’s The Synthesis Server Co., Ltd., Contractor: Hem Heepkaew of Happening Design and Construction Co., Ltd. 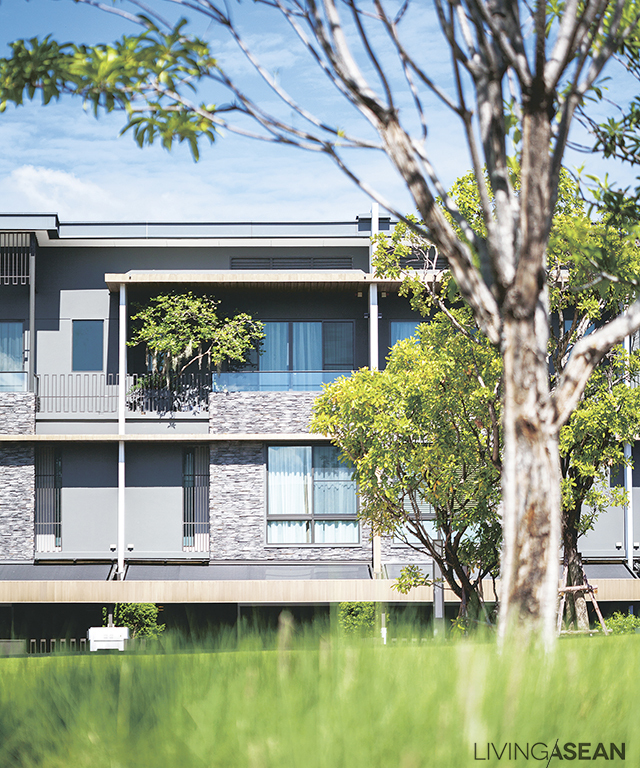 The townhome stands prominent behind green grass and trees. 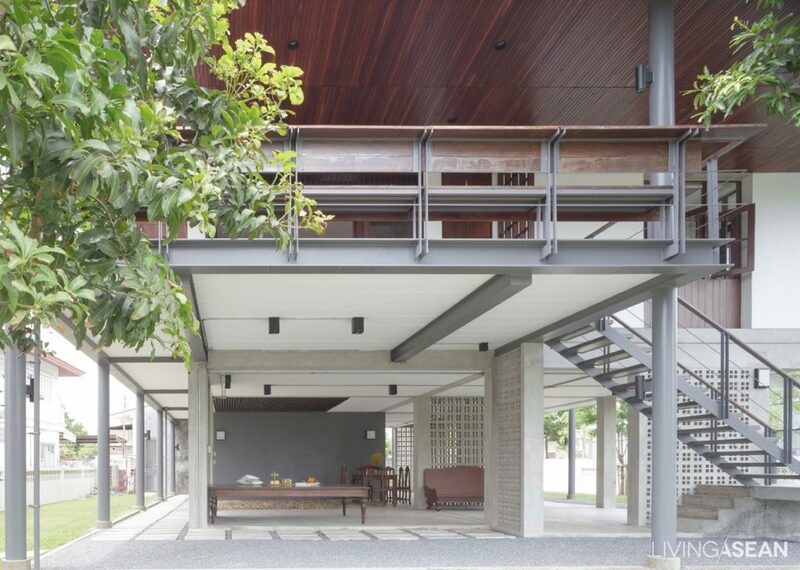 The house exterior features wood and stone, also containing the spirit of nature. 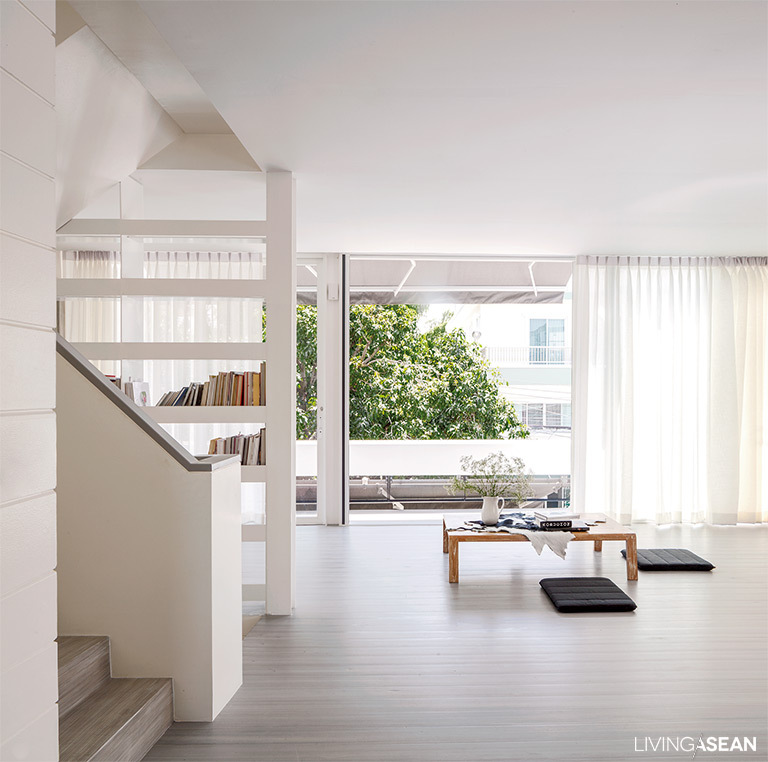 The simple lines of the house in grey, white, cream, and brown convey a feeling of comfort. 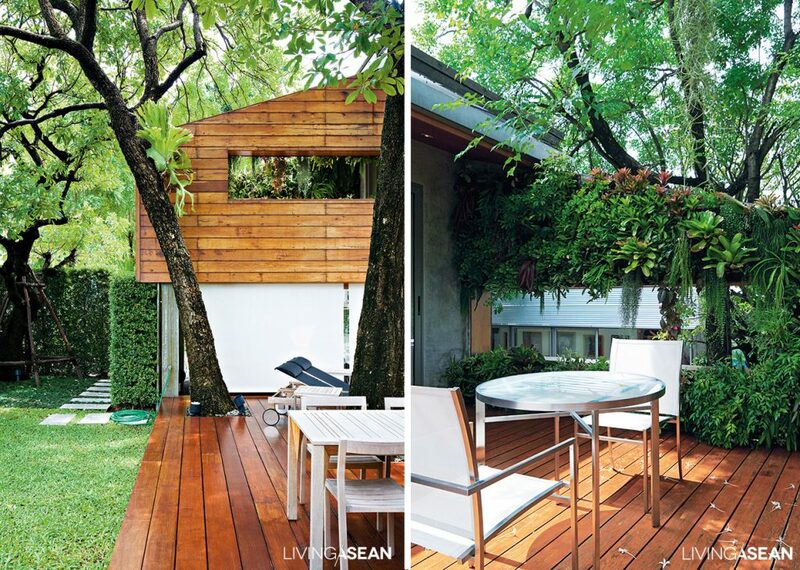 A relaxing spot in the front: A banyan hedge by the kitchen forms a sweetly refreshing green wall. The family’s favorite hangout, with fancy furniture and bright gold ornamentation harmonizing in a common theme. 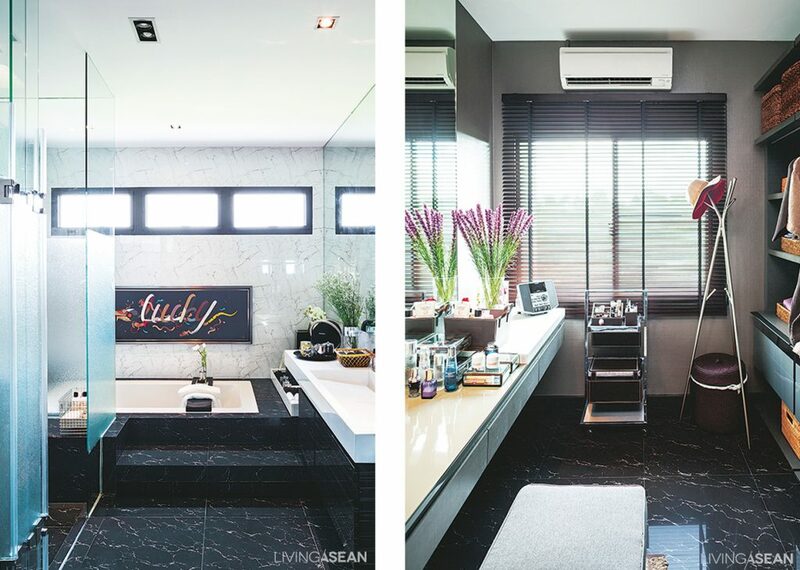 A wall of black marmo granito in the back almost makes you think you’re in the lobby of a 5-star hotel. 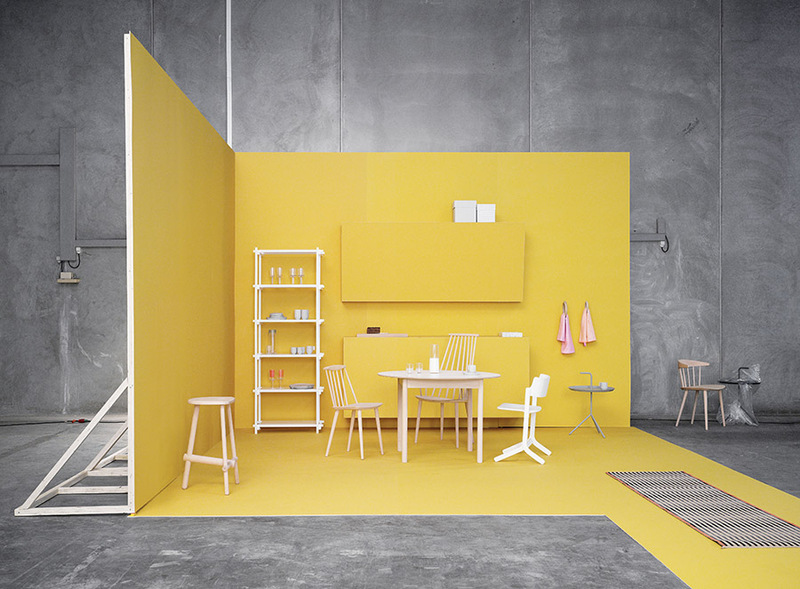 Dining corner, with a mixed array of furniture. 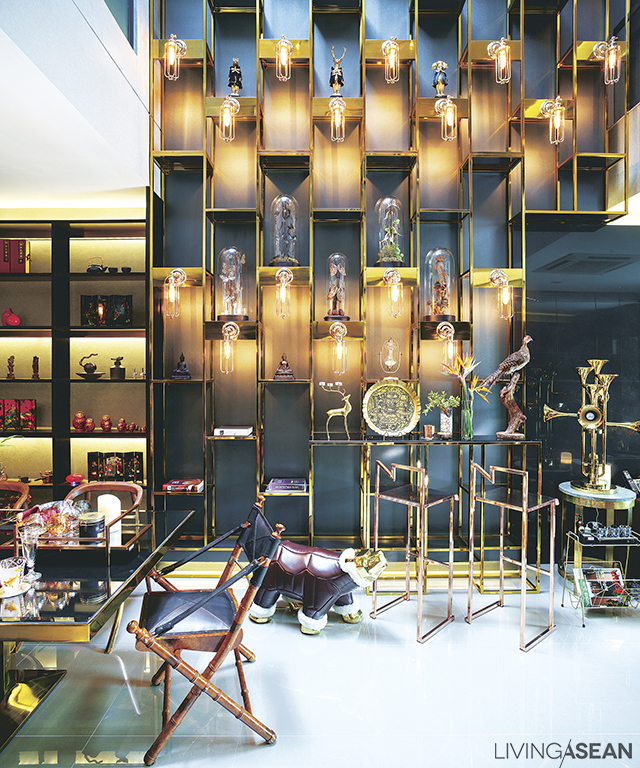 At the side is a show wall with some of Pantavit’s most prized collections. Pretty posh for a “townhome”, the mood is reminiscent of a formal dinner in a luxury hotel. 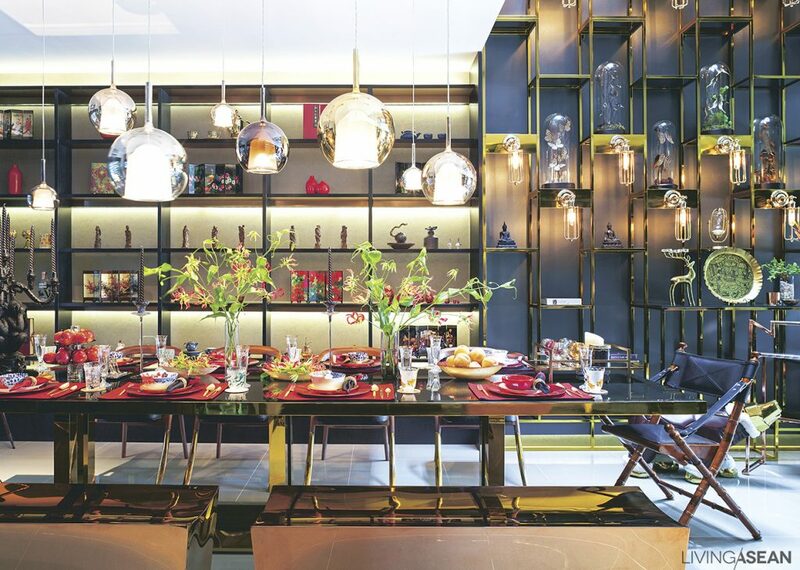 An emphasis on lighting arrangement and bright, shiny furnishing makes for a uniquely elegant charm. 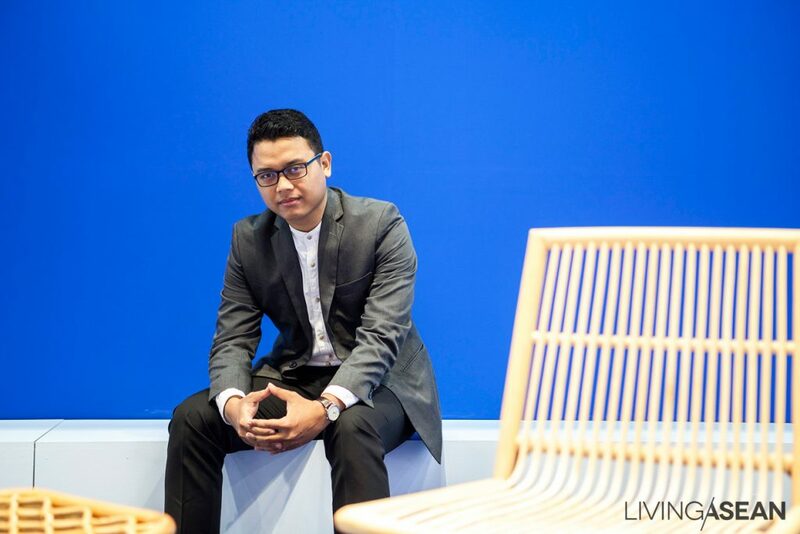 Pantavit Lawaroungchok, owner/design director of “Apostrophy’s” design studio, was experimenting with new urban living concepts and transformed his family’s property into something resembling a ritzy resort. 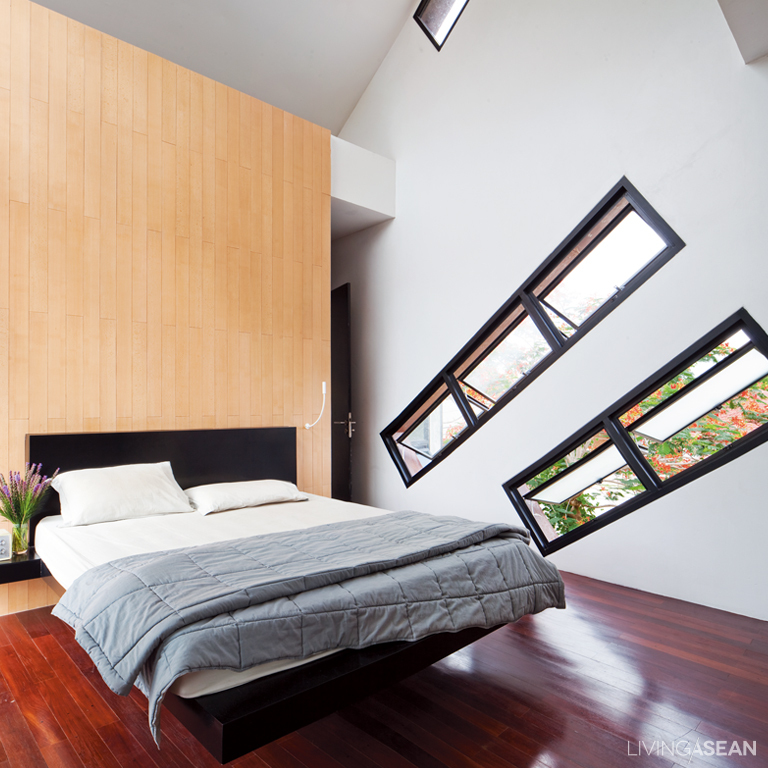 There are a lot of remarkable things about this house, beginning with the large central room’s “triple space” concept vertically connecting it to the sky, with a three-story tall clear glass “moonroof ” that opens and shuts by remote control to add dimensions of light and shade to each level. 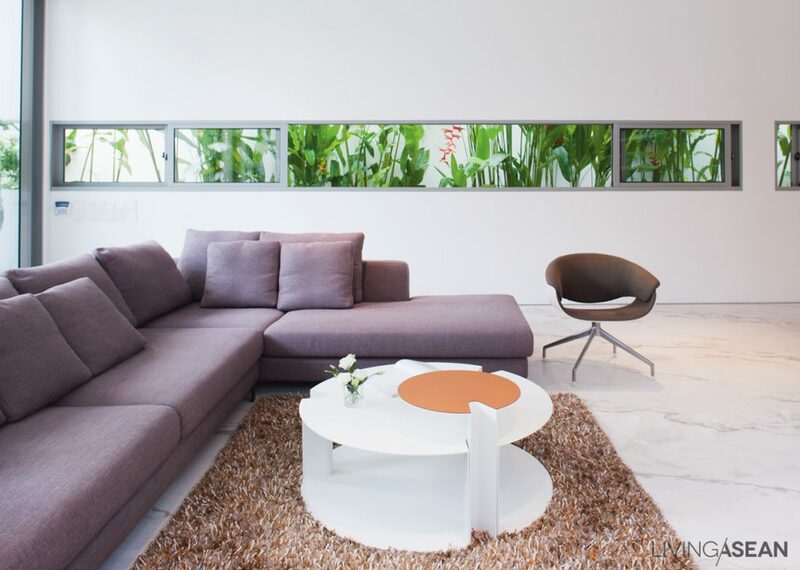 The open design also facilitates interaction among family members between floors. 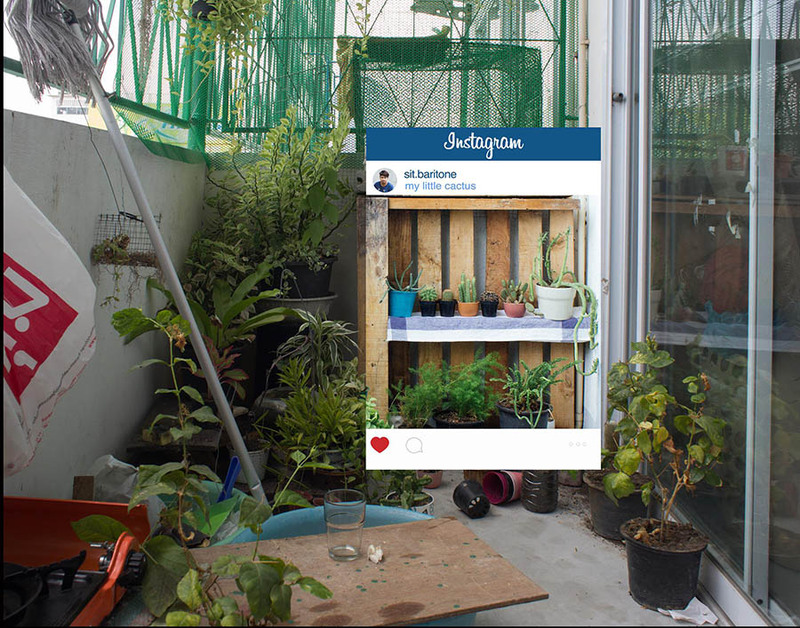 On the first floor is a living room, dining area, kitchen, and vertical garden. 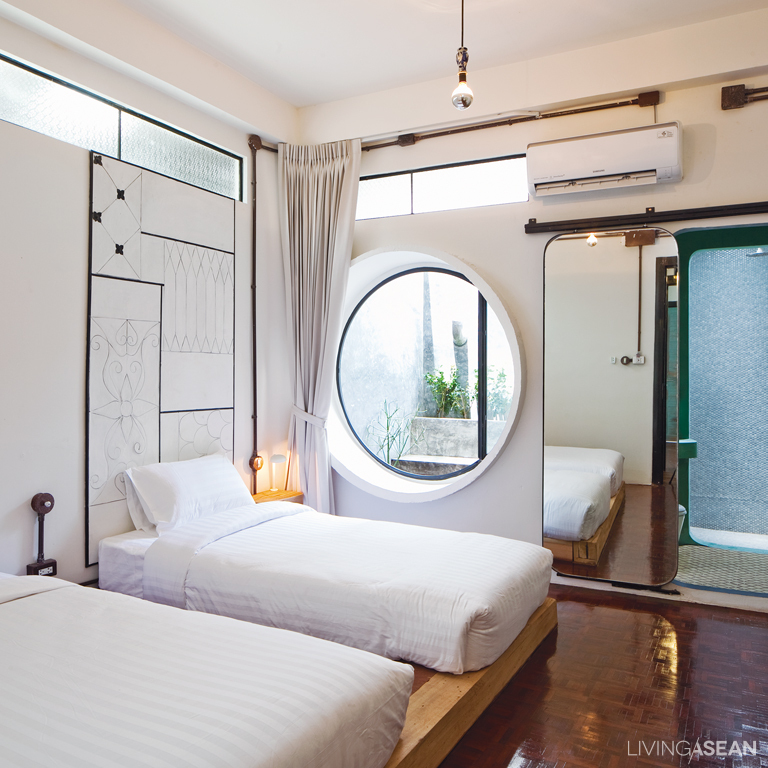 Pantavit’s mother’s and aunt’s bedrooms are on the second floor, along with a small living space and Buddhist altar room. The third floor holds Pantavit’s master bedroom, actually more a kind of super-fancy penthouse with a bedroom, an entertainment area, a master bathroom , a dressing room, and a small garden on the balcony. From the dining room looking out toward the entryway in front: furniture arrangement clearly splits the space it into definite zones. /// One of Pantavit’s favorite spots is the 3.5-meter dining table. It doubles as a place to work, or just to read. 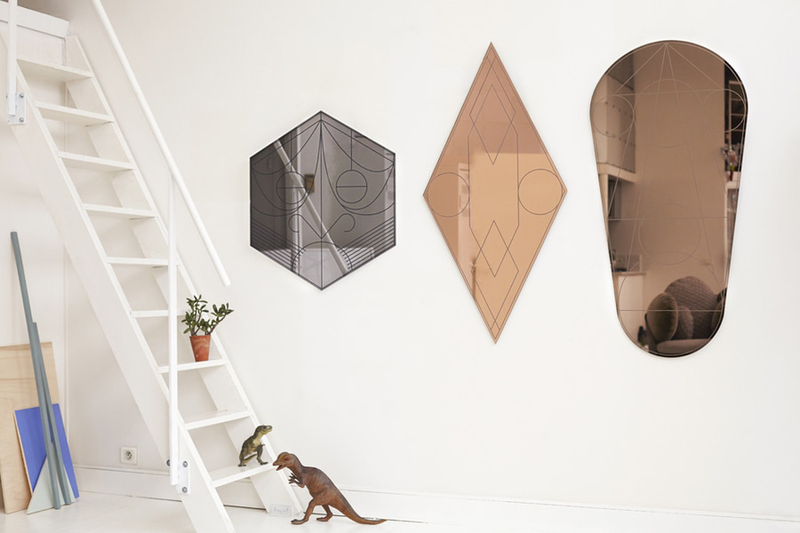 Cabinet shelves have a mesmerizing shine: these are fabricated separately, then put together and finished using a spray-paint technique similar to what’s used in auto body shops. 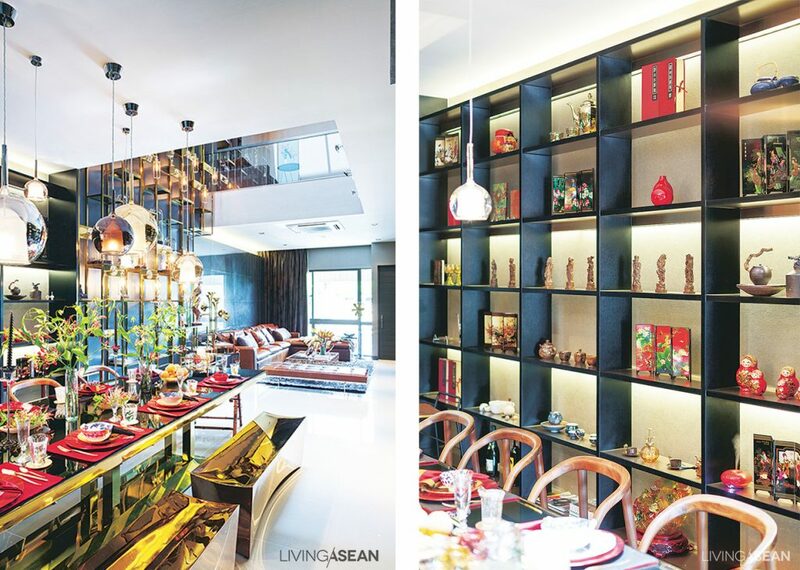 Its interior decor consists of furniture and other items with a contemporary Asian look, a lot of it collectibles Pantavit fell in love with and brought back from trips abroad. 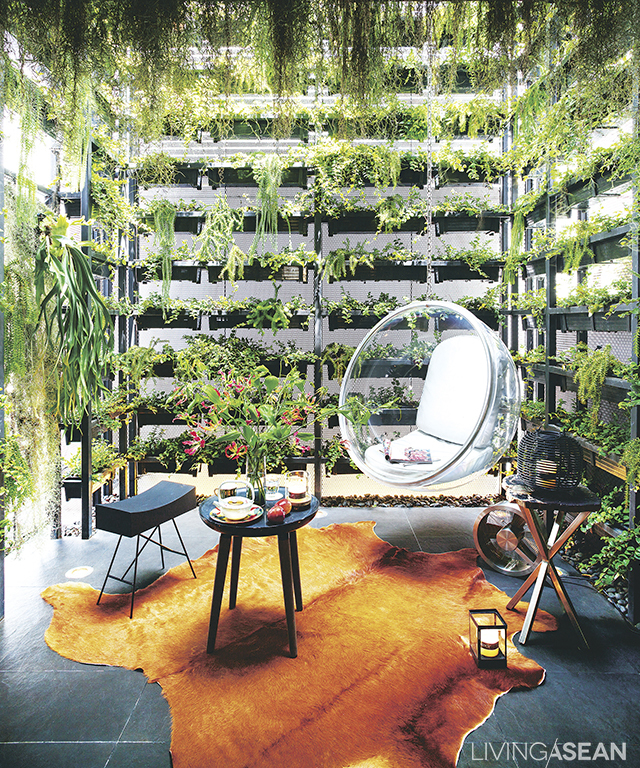 The area in back is built out into a 7.5-meter-high vertical garden, with plants divided into 3 zones, each receiving the same amount of light, moisture, and water through an automatic sprinkler and UV sun lamp system. The automation helps ease the hurried lifestyle of urban dwellers. 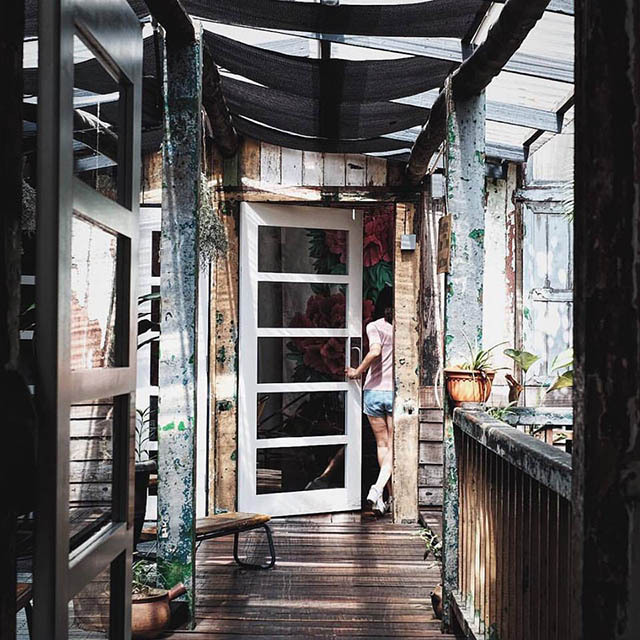 The exotic oriental house design is a fine expression of beauty that can be found in mixing Asian styles, and at the same time is a useful experiment in urban family living and novel use of space. 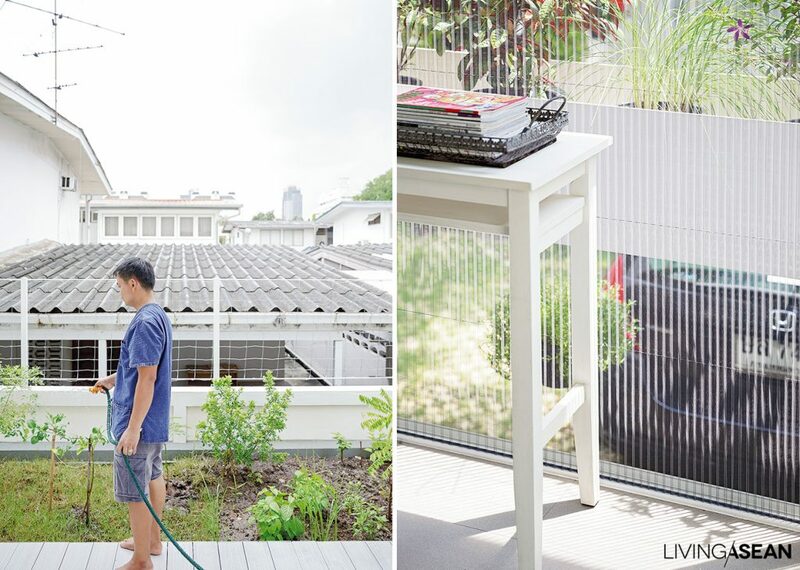 The back area of the townhome is transformed into a super-hip vertical garden. 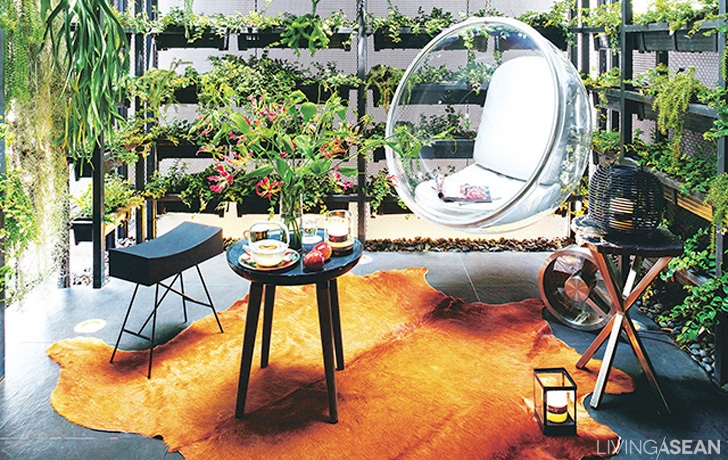 Here you can lounge around in this hanging modern-looking bubble chair made of clear acrylic. The stairwell is decorated with a very interesting abstract painting, intentionally placed there for its patterns that play with the planes of wall and floor. 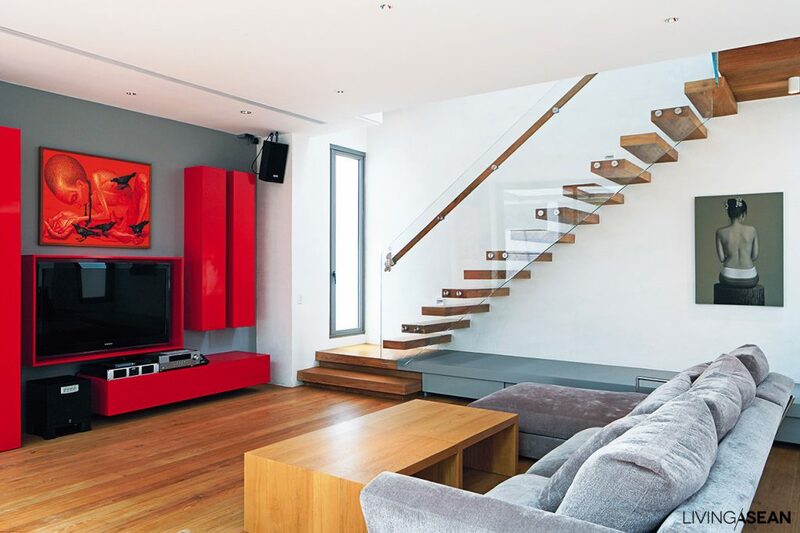 /// A “living room” corner on a mezzanine level has a warm, easy atmosphere. 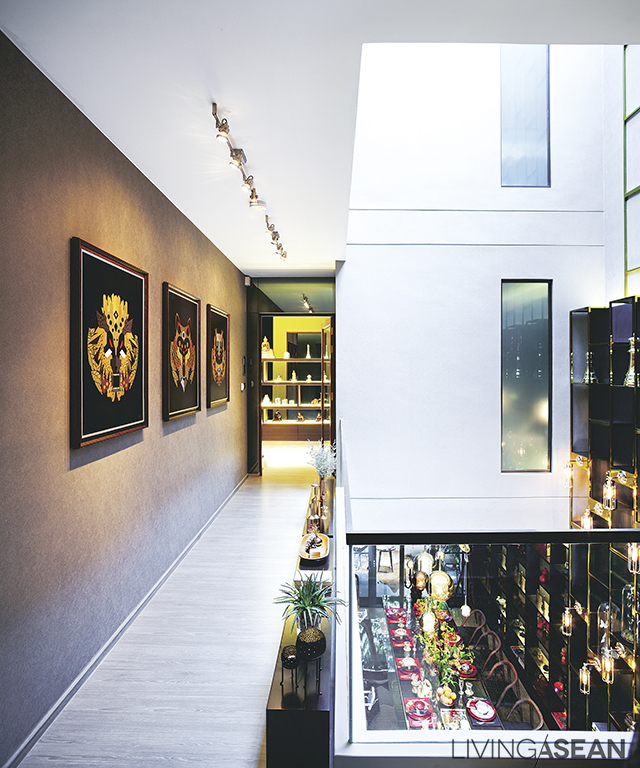 The walkway on the second floor is lined with beautiful pictures. From the guard rail, the lower floor can be seen, and family members on different levels can interact. 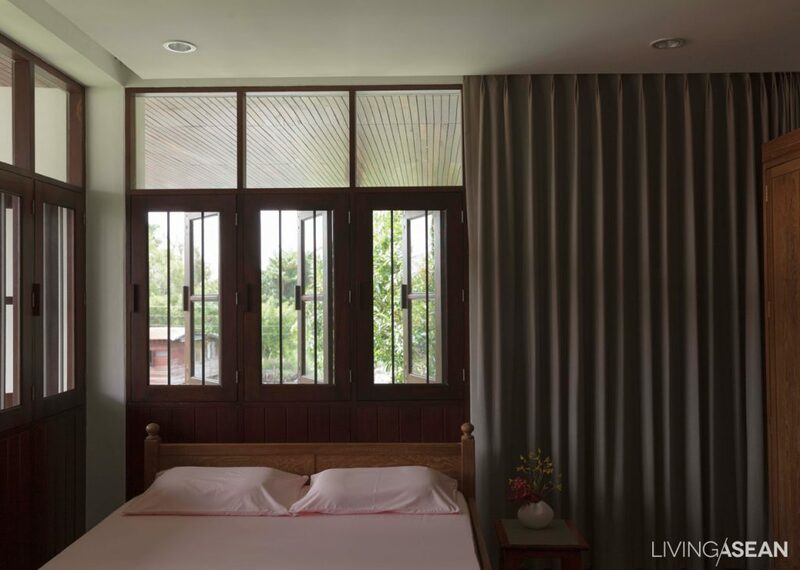 Inside Pantavit’s aunt’s bedroom we’re greeted by soft, inviting, and restful lighting. 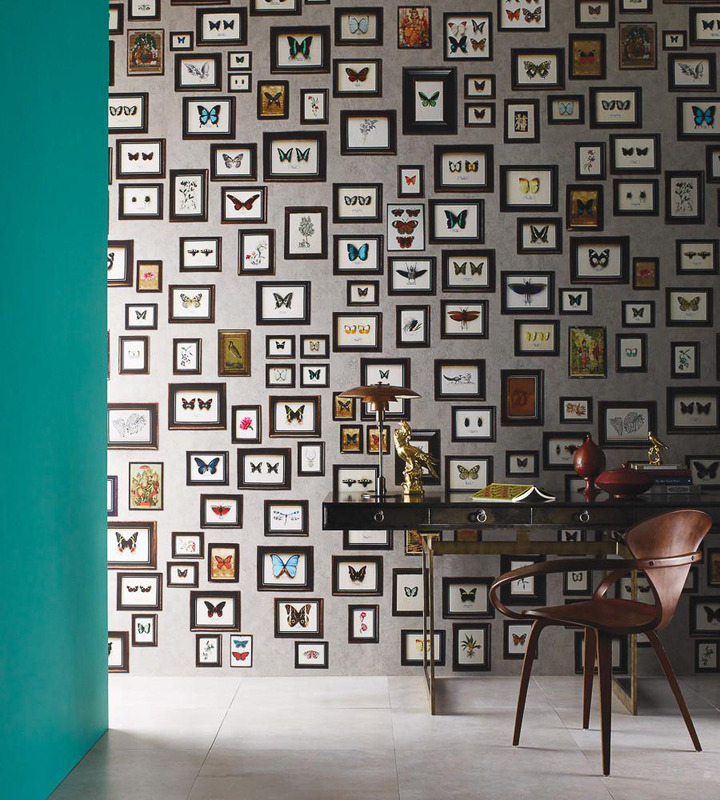 The vertical patterns on the wall fools the eye into thinking the room is larger than its actual size. The master bedroom on the third floor is done in white, cream, and browns. 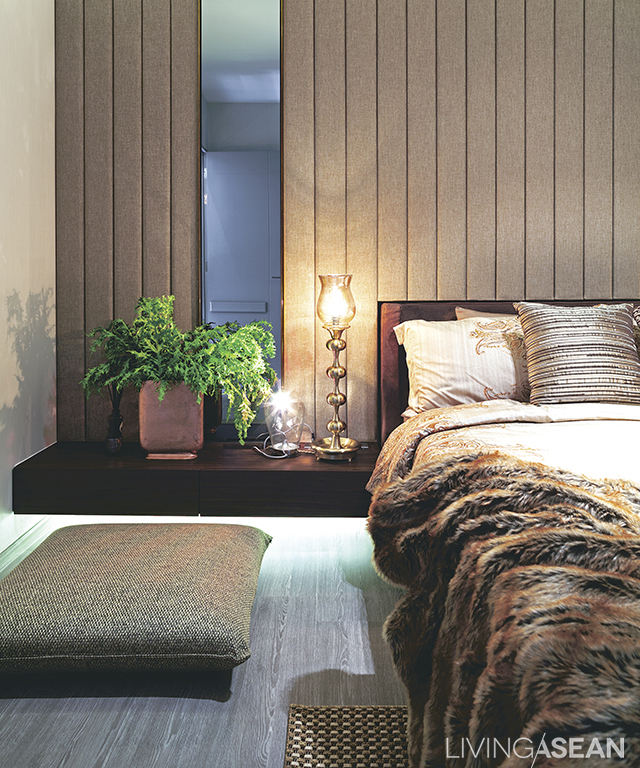 Mirrored panel behind the headboard makes the room appear to be larger. The master bath has a shower section and a bathtub. A washbasin is designed for two. One of the walls has openings to let the natural light in. /// In the master bedroom directly adjoining the bathroom, a dresser is arranged along the wall in the dressing room. Venetian blinds are on one side of the wall for sufficient light during makeup.